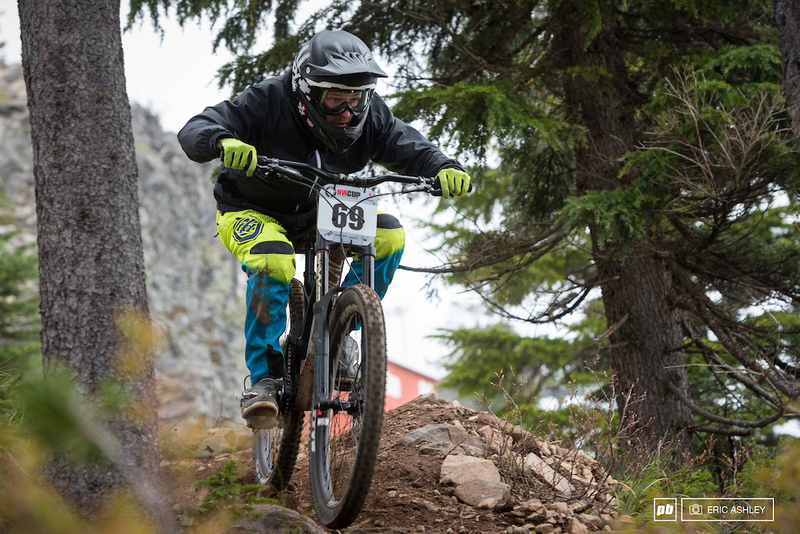 The NW Cup generally follows a familiar pattern: wet and rainy spring openers, dusty summer laps, and tacky autumn finishes, and with the exception of the sporadic off-season rain shower, not much interrupts the cycle. Except for this year, when Mt. 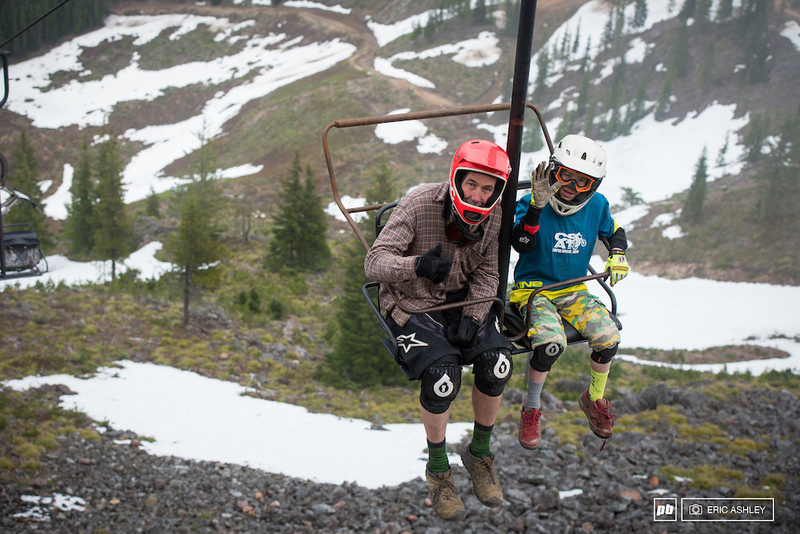 Hood Skibowl was still blanketed under an overly healthy layer of snow in mid-May. 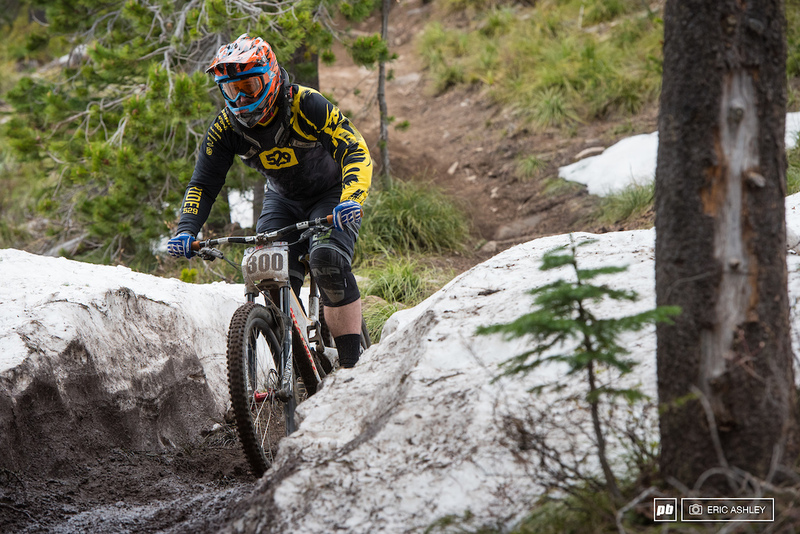 For the first time in the series' history, the call was made to postpone a race. 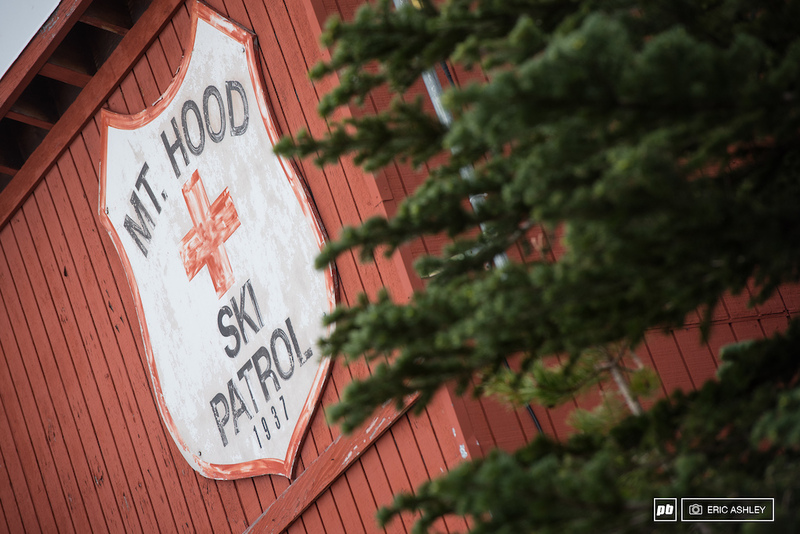 The extra week gave the mountain’s trail crew some needed time and several straight days of higher temperatures to finish shoveling out the courses. 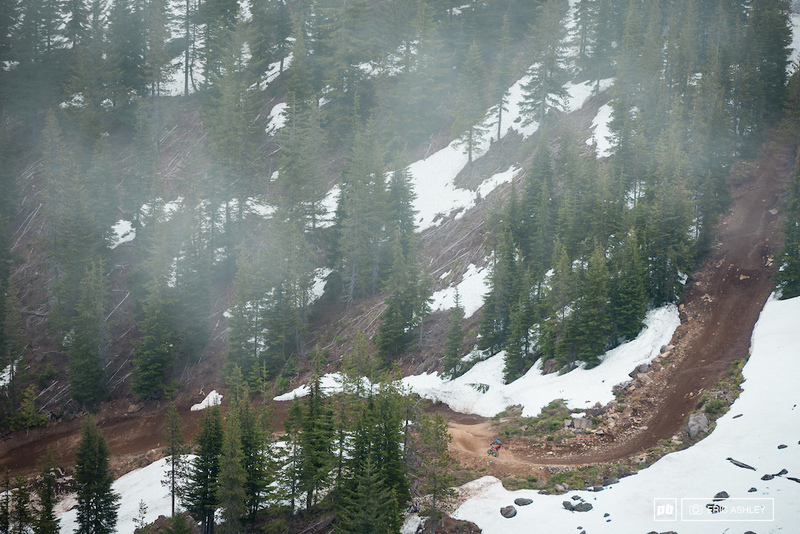 Ethan Lieb sends the signature step-down on Cannonball against a snowy backdrop (Cat 1 Men 0–18 ). 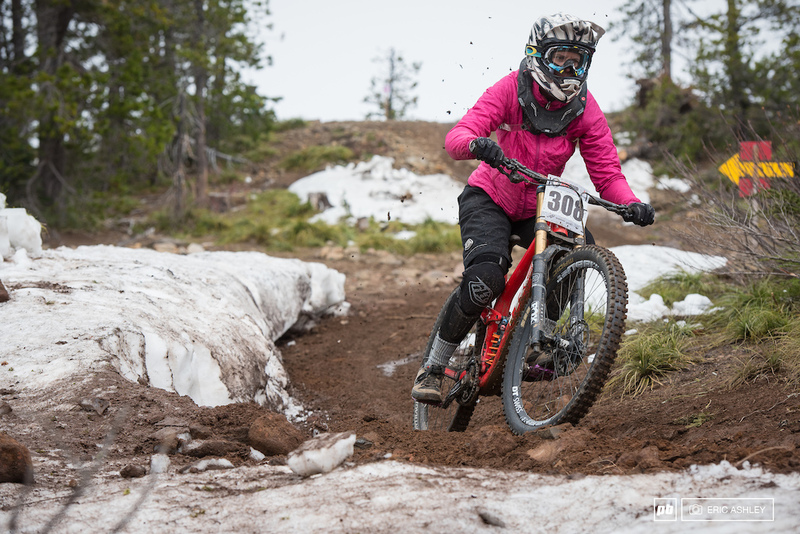 By the time riders showed up, conditions on-course were good, even unusually smooth. Open practice on Friday was blessed with bright sunlight that was soon replaced by a shroud of clouds at the start of the next two days. 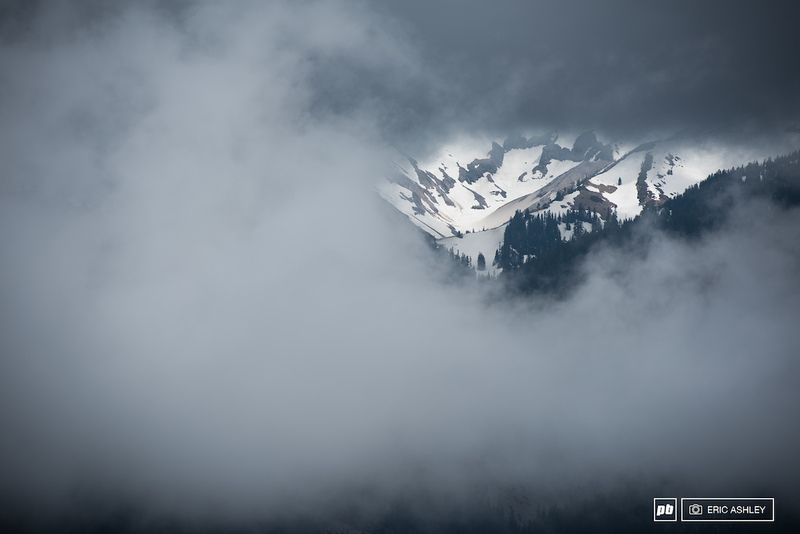 Cold mists and steady winds kept things "crisp" as the alpine scenery begrudgingly moved toward summer. An afternoon wedding kept practice times short on Saturday, so racers had to make good use of their morning practice run on race day. 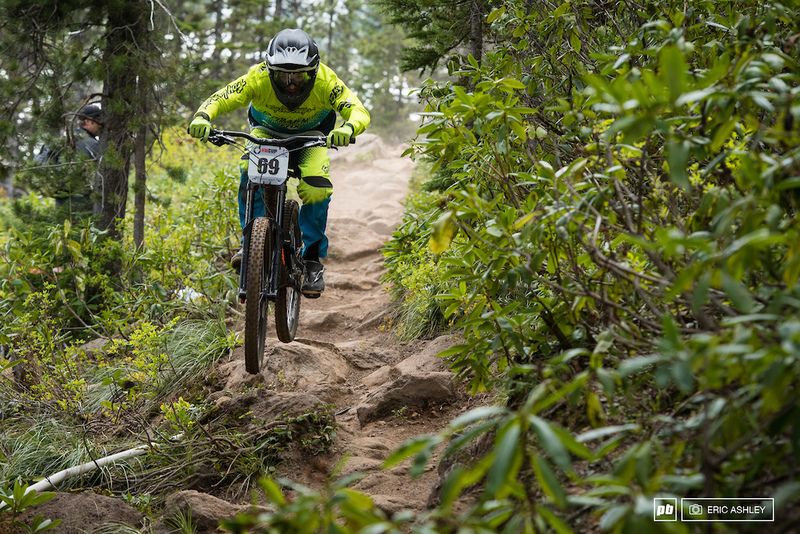 Seeding runs saw Dylan Brown with a healthy lead followed by Colton Wiersum and Bryce Kans for Juniors. 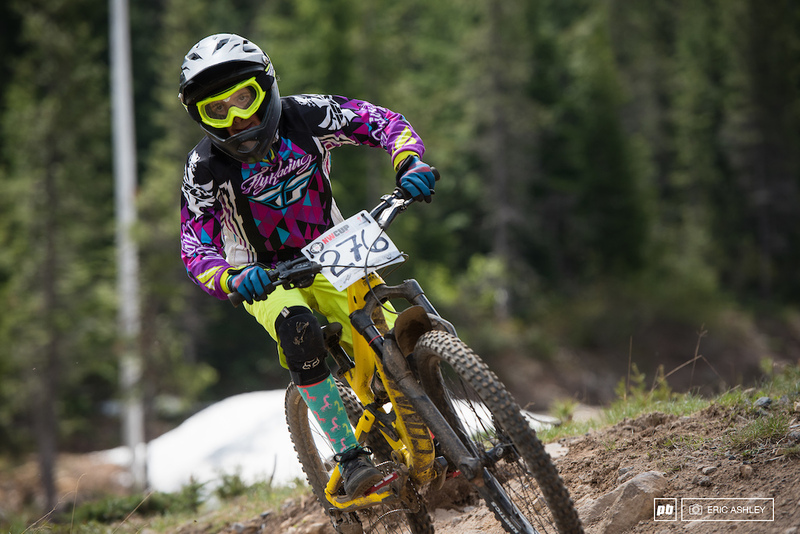 Local rider Kerstin Holster ended ahead of Kaytlin Melvin, and Lauren Heitzman-Patterson for Pro Women. Nate Furbee put in a time of 3:28.63 for Pro Men with Matt Orlando and Evan Geankopolis coming next. 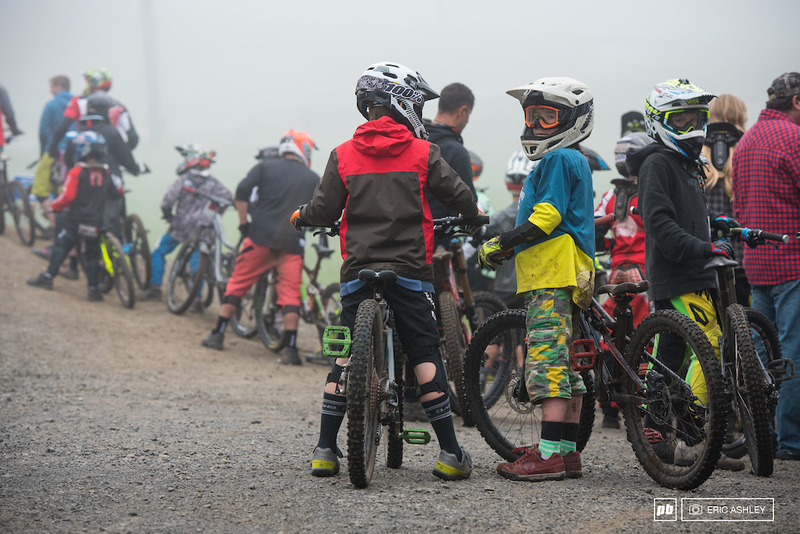 Mornings started with a huge helping of pea-soup fog. Mt. Hood barely put in an appearance until the clouds started their slow retreat when the Cat 3 groms dropped in on a shortened course of just Gnar-Gnar. The rest of the Cat 3 field battled the long fire road down the mountain and ended on the Fire Hydrant Trail. 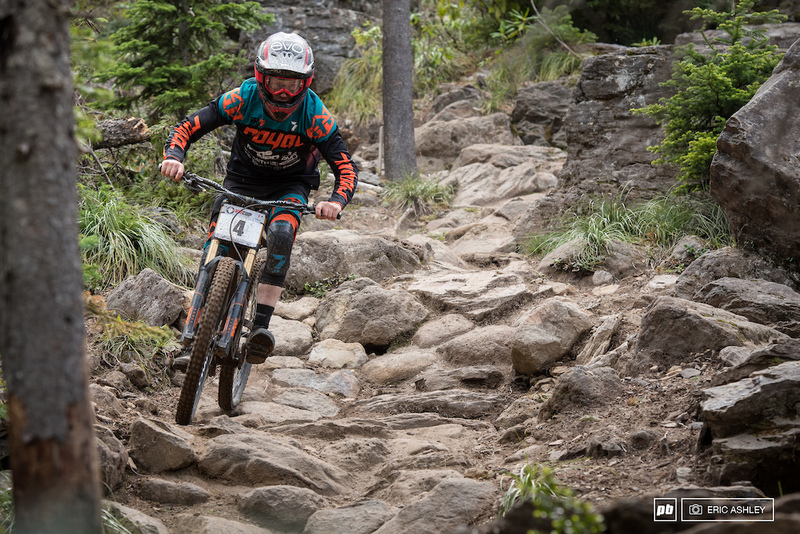 Cat 2 racers took Fireball to Cannonball for a fast but relatively smooth descent to the rock garden on Fire Hydrant, before ending with the Wood Trail. 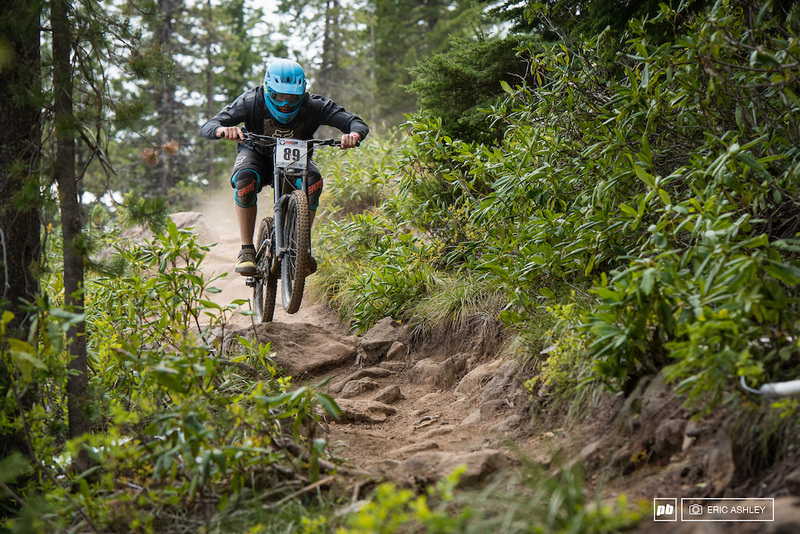 Cat 1 and Pros followed the classic Skibowl run full of sharp rocks, bomber descents, burly rock gardens, and a rooty finish. Catching up during the morning traffic jam to get practice runs rolling. 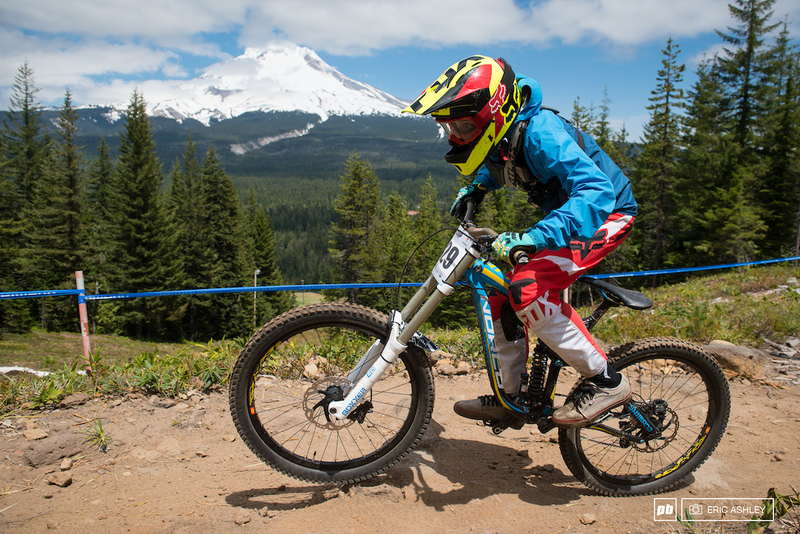 Dylan Brown put together another solid run to maintain the lead and take his first Juniors Win. 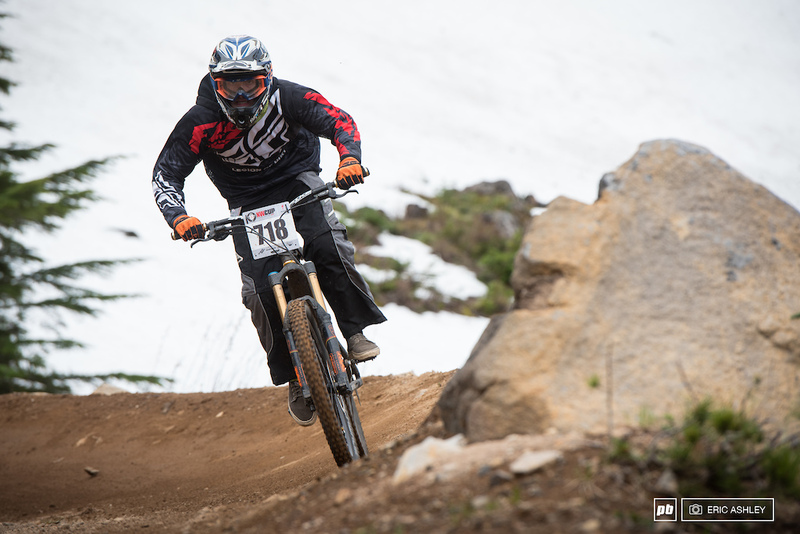 Following him was Joshua Fultz-Veirhotke whose up-and-down weekend came together for his race run. Steps three through five were filled by Declan Ervin, Chris Wharton, and Bryce Kans. Kerstin Holster shaved some time off her run, but it wasn't enough to beat out Kaytlin Melvin who surged ahead to first. 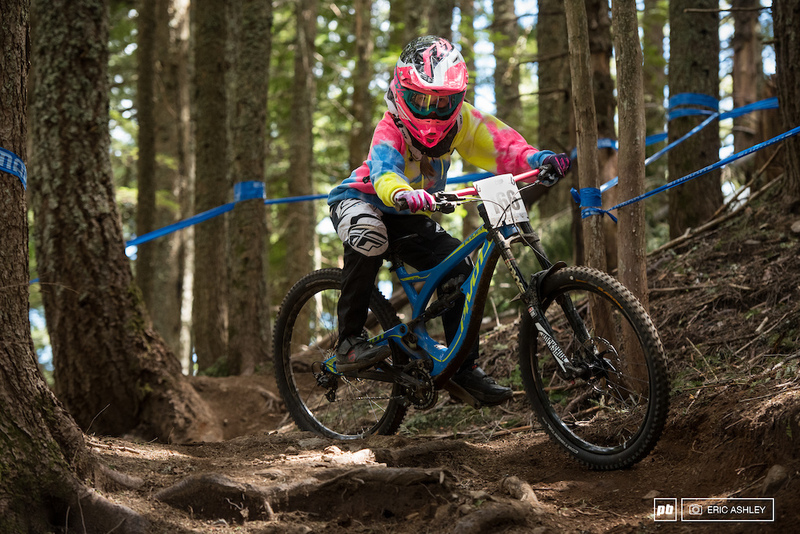 Lauren Patterson held third to round out the Pro Women's Podium. 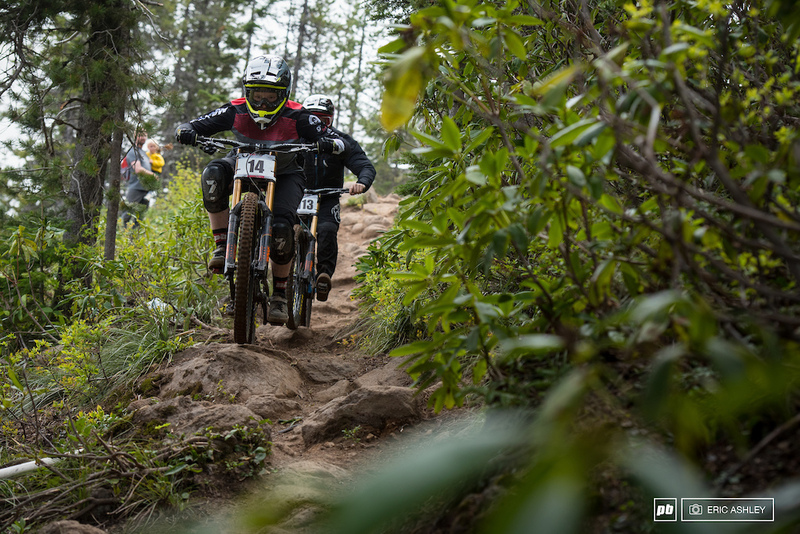 At home on a fast and rough course "suited to his riding style", Nate Furbee not only defended the top spot but laid down a new course record of 3:23.59, almost four seconds ahead of Carson Eiswald. 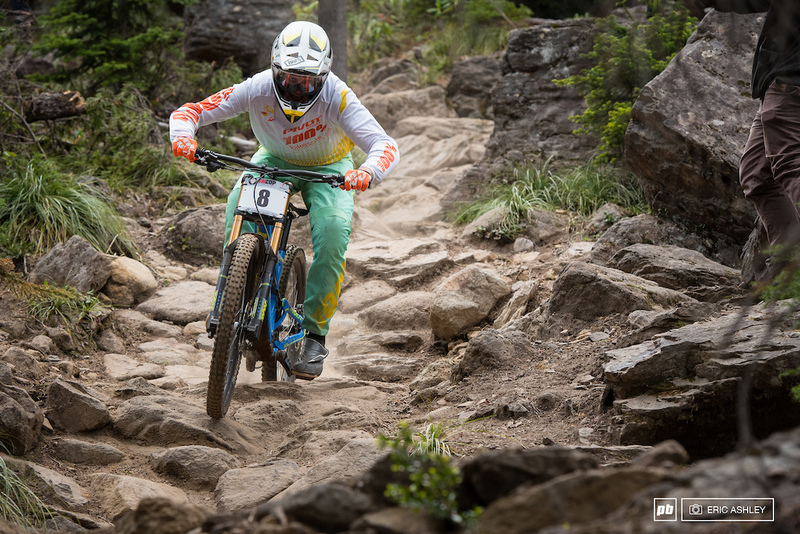 Trevor Lewis rallied to claim spot number three ahead of Kasper Dean and Nikolas Clarke. 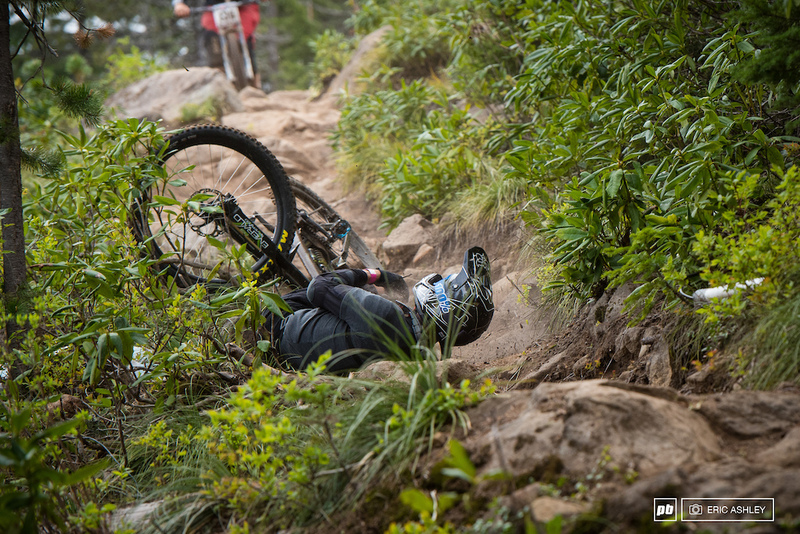 Matt Orlando looked primed for a podium finish, but a front flat took him out of the contending near the end of his run. 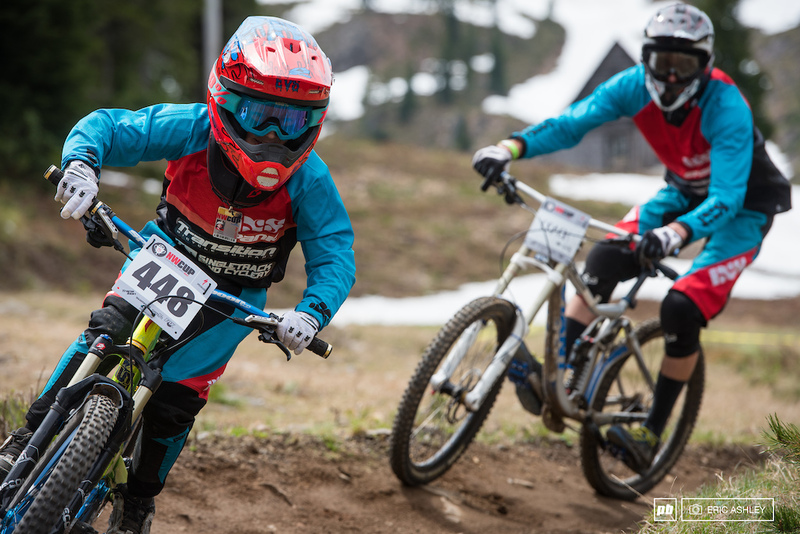 The NW Cup heads to an all-new venue at Tamarack Bike Park in two weekends (June 16–18 ). 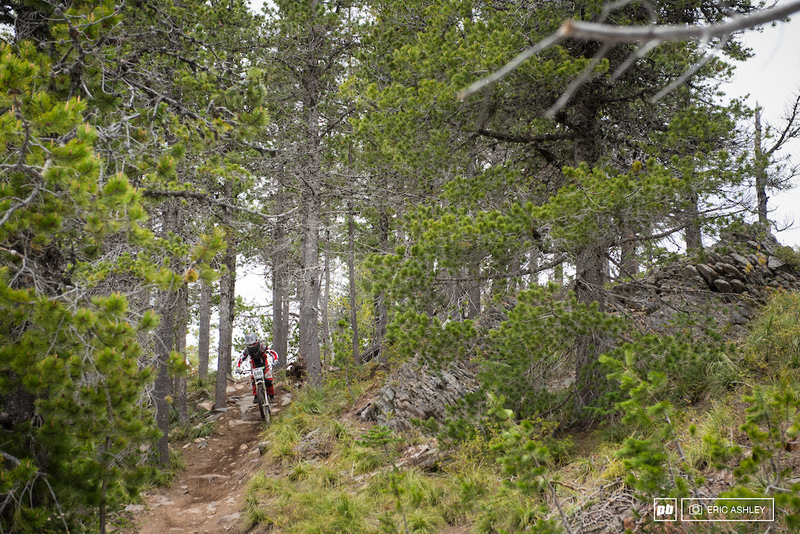 Come check out new courses and the most southerly stop of the series. 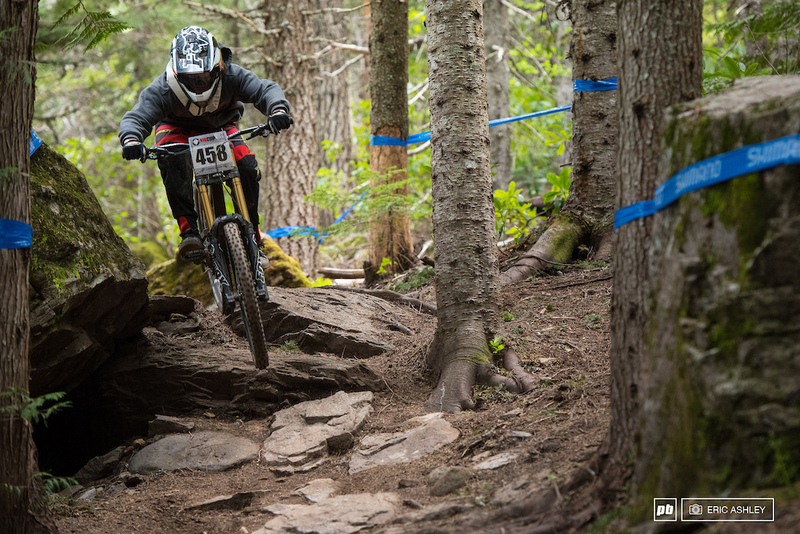 Corner one on the Cat 2 and 3 course was slick and off camber, making for a tricky start. Bethany Holman (Cat 2 Women 19–39). Drift too far in and you'd stir up a mess. Chaye Williams (Cat 3 Men 15–1 . 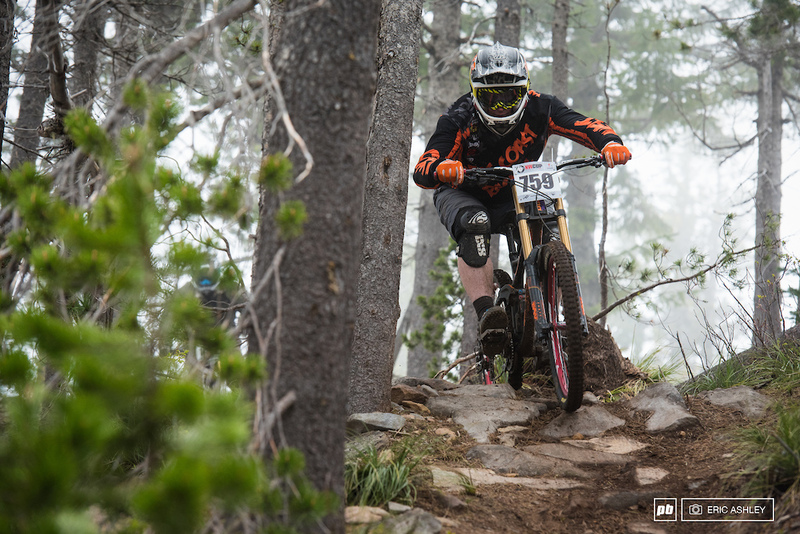 West Coast Racing's Doug Park glides through the fog at the top of the course (Cat 2 Men 40–49). 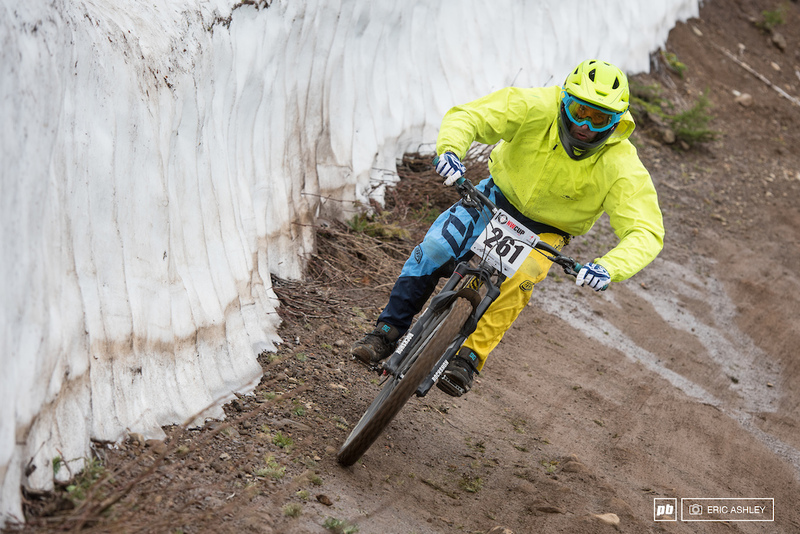 The piles of snow didn't have too much effect on conditions beyond some interesting channels and some muddy patches. Cory Yalowicki (Cat 2 Men 30–39). Jason Neumann lets out the speed at the end of Fireball (Cat 2 Men 40–49). 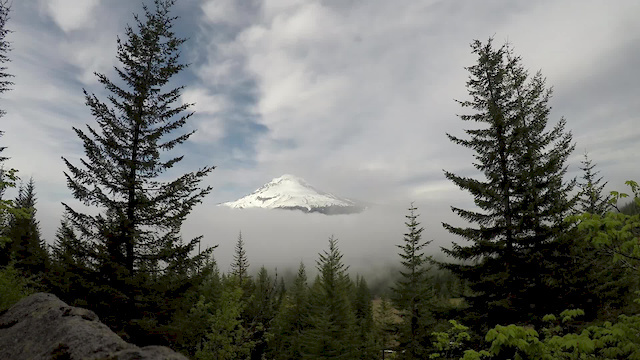 When the clouds do clear out, Skibowl has some pretty amazing views. 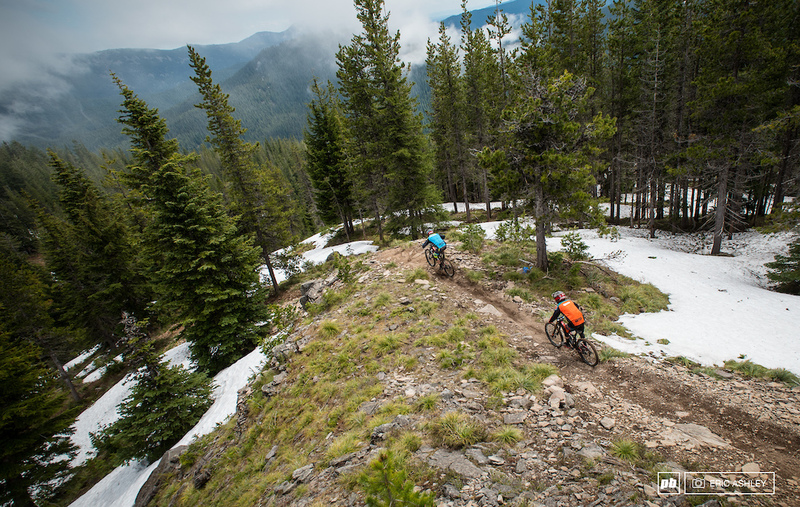 Matt Orlando and Jake Grob made good use of a small window of sunlight as they sped down the Ridge Trail (Pro Men). 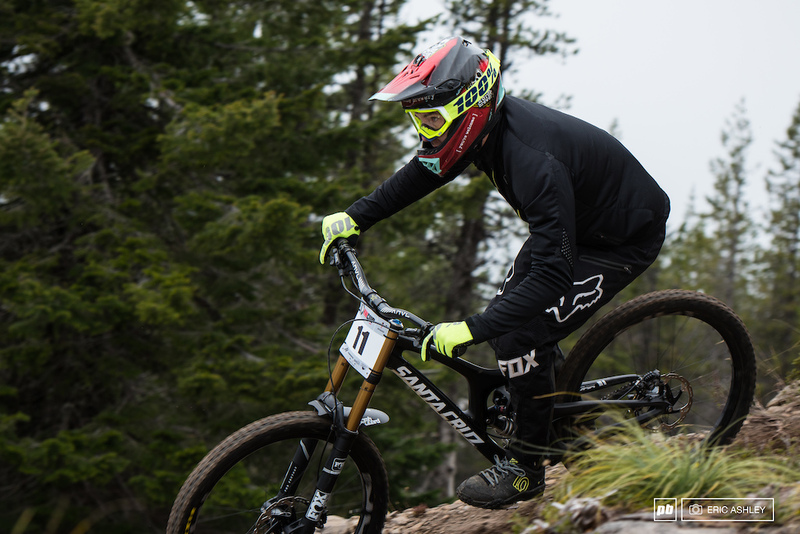 Kody Clark's riding seemed more finessed after last year's hard crash at Skibowl (Pro Men). 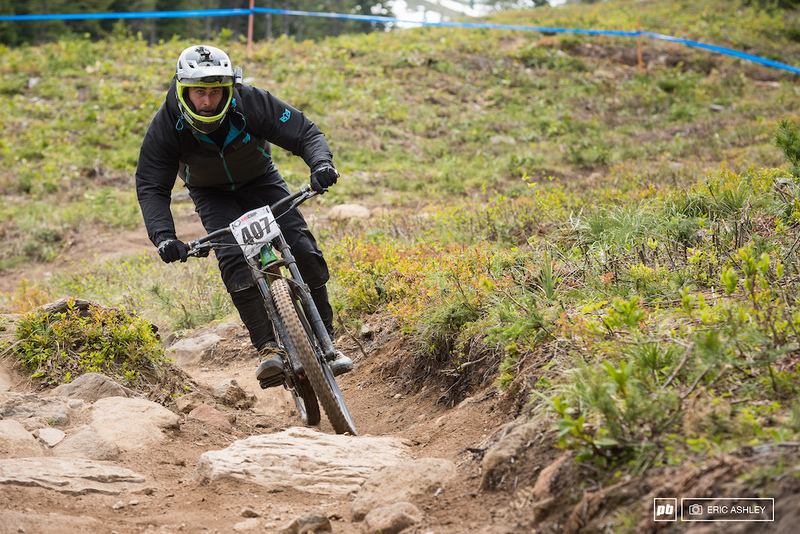 Nate Furbee puts in a starting lap on Saturday's practice (Pro Men). 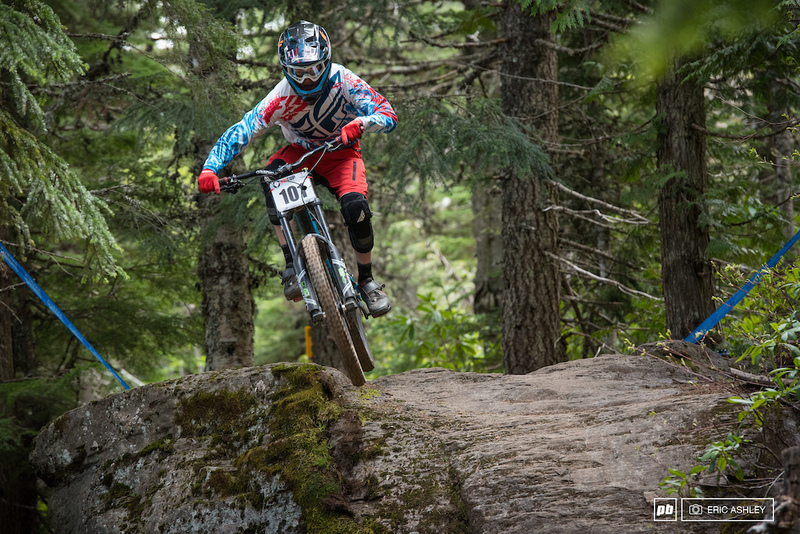 Kevin Littlefield throws in a handful of boost on a long step-down on Cannonball (Pro Men). Just a few weeks ago, all of this was under a heavy blanket of snow. Skibowl's trail crew worked hard to get things ready and made good use of the extra week to make sure the snow was cleared away. 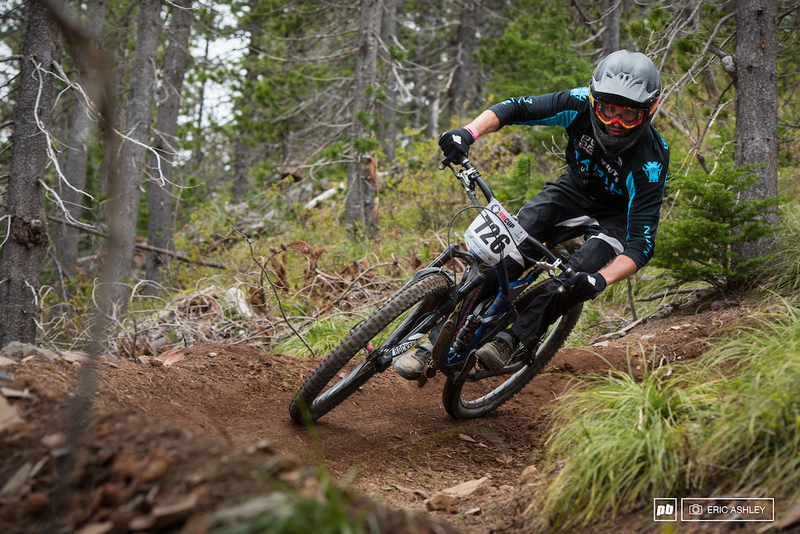 Joshua Fultz-Veihotke had a turbulent weekend but got things sorted out in time for his race run (Cat 1 Men 0–18 ). 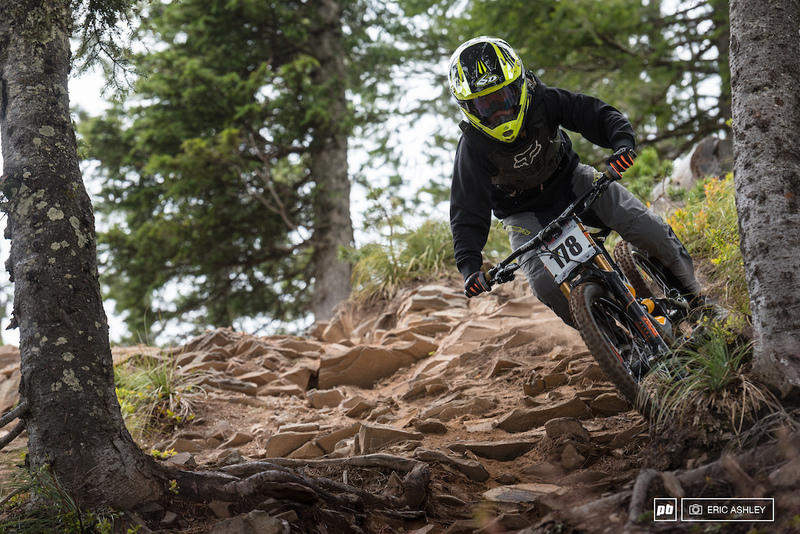 Kasper Dean partakes in some rock garden bike-train goodness (Pro Men). 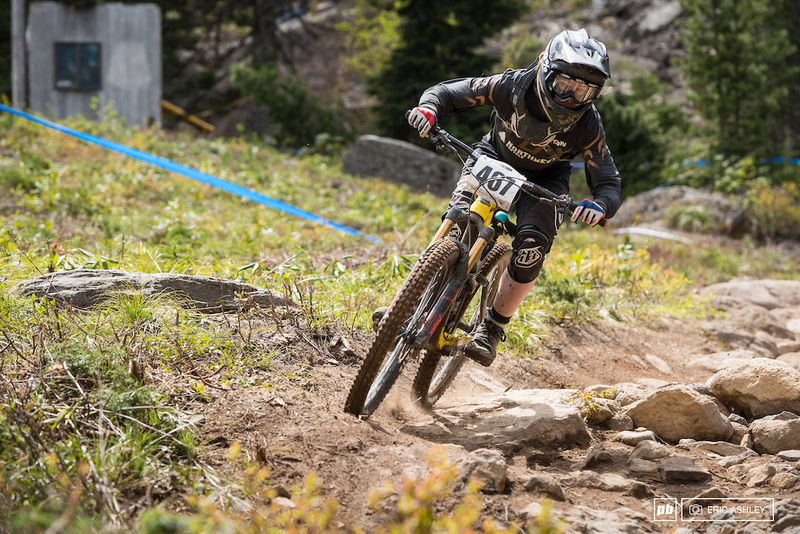 Chris Canfield came through mostly unscathed after losing his front wheel (Cat 1 Men 30–39). 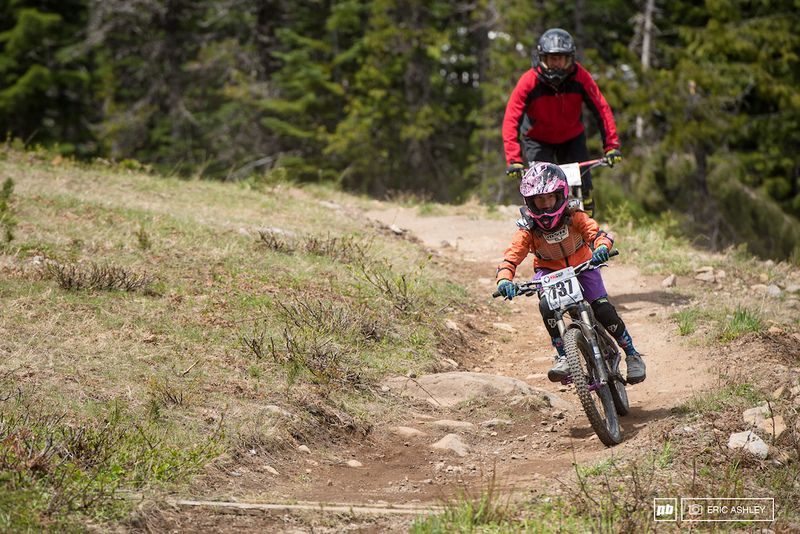 Kaytlin Melvin and dad Kelly Melvin work out some final lines in the rock garden (Pro Women). 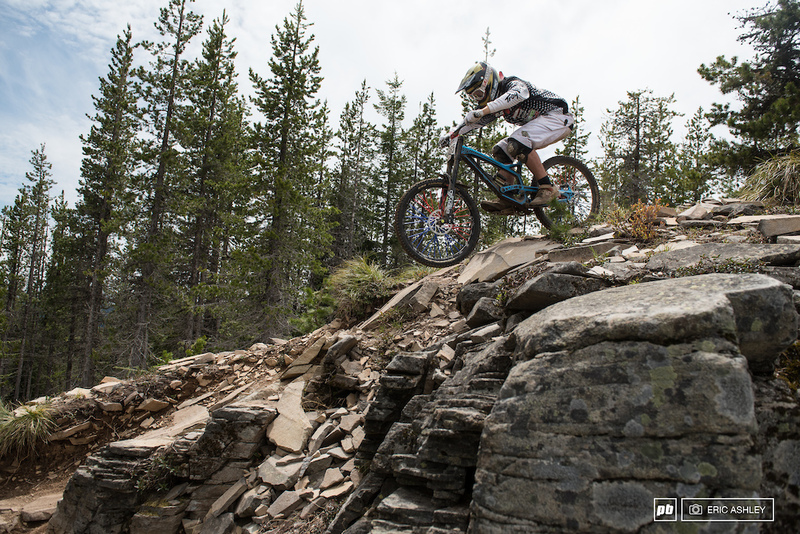 Jake Grob lines up a clean exit through the rocks and chunk (Pro Men). 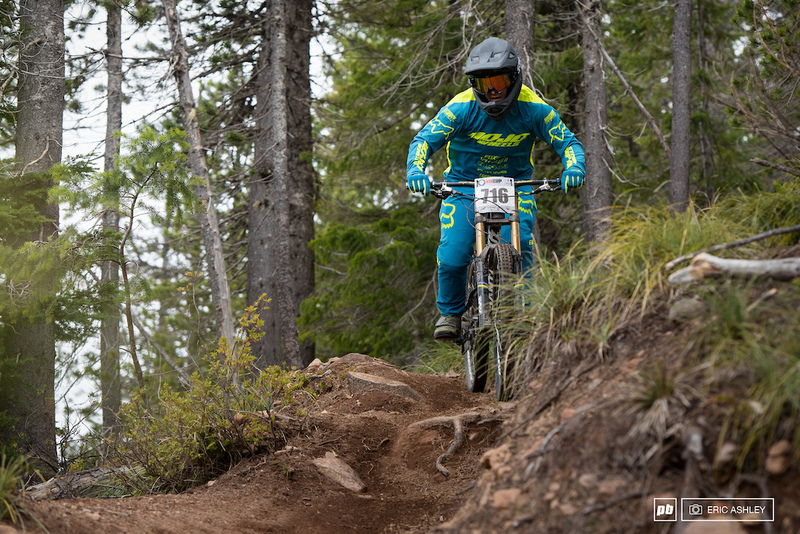 Nate Furbee scopes out the straightest line through the gnar before the end of practice Saturday (Pro Men). 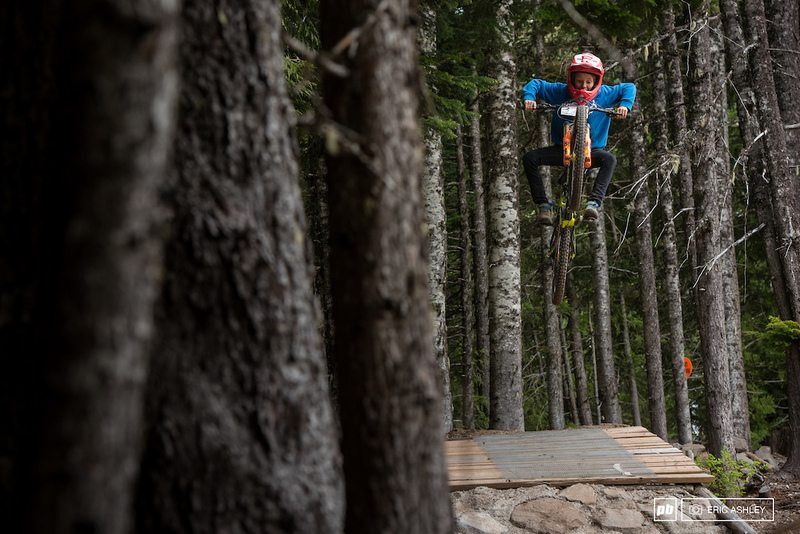 In addition to some formidable trails, Skibowl has a nice little skills zone adjacent to the lodge. 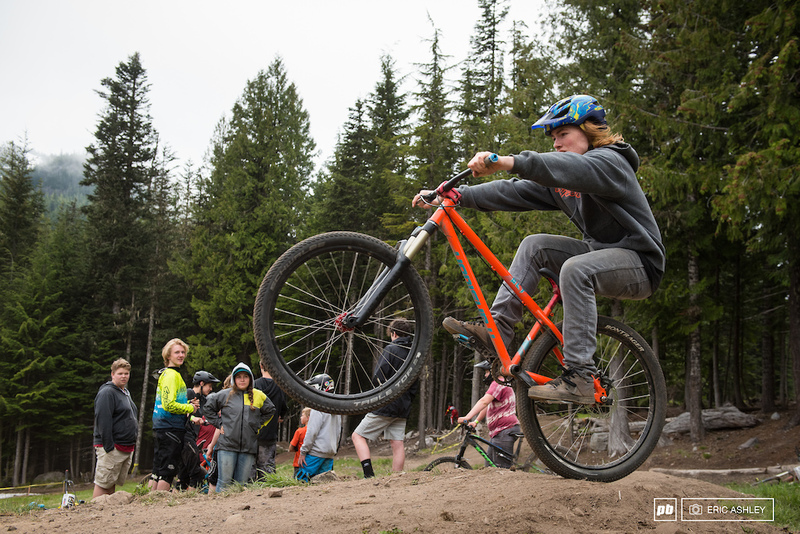 One-footers were the participants’ trick of choice for the evening. 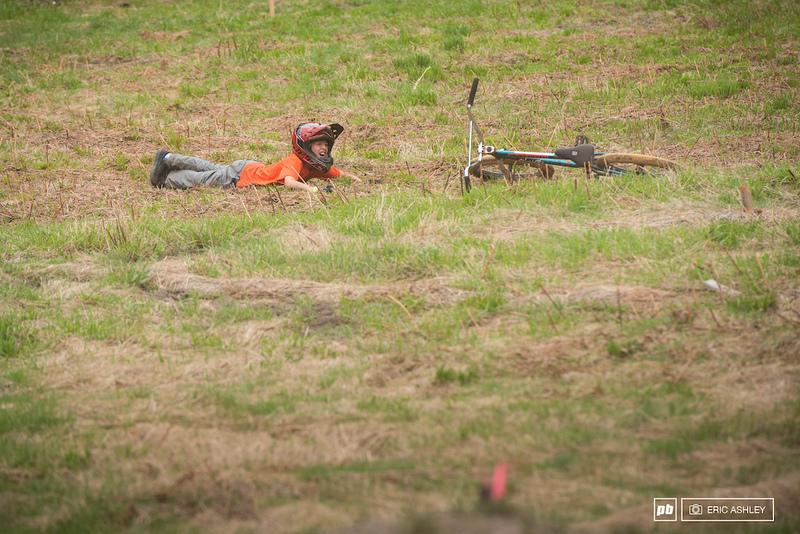 A young rider deals with the pain earned from a poor landing and a collision with the seat. Jackson Goldstone took third during an unscripted high-jump contest (Cat 2 Men 0–14). Simon Patamia boosts for his shot at glory (Cat 2 Men 15-18 ). 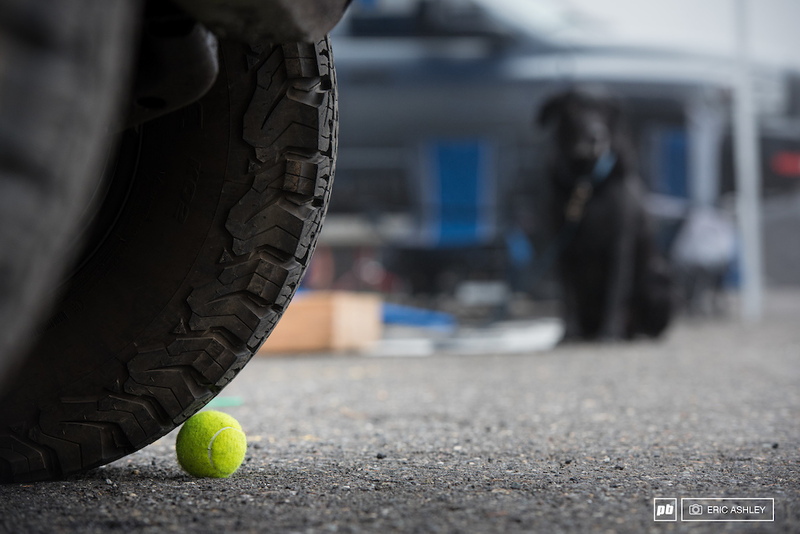 Sometimes, the prize is just out of reach. In a few weekends, this alpine pond will be all gone, replaced by a meadow of grasses and flowers. 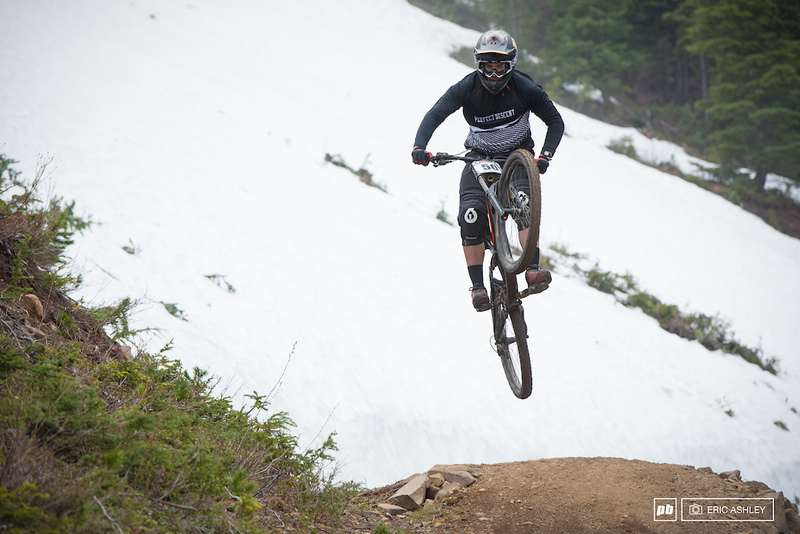 Matt Orlando throws in some flair on his morning warm-up ride (Pro Men). 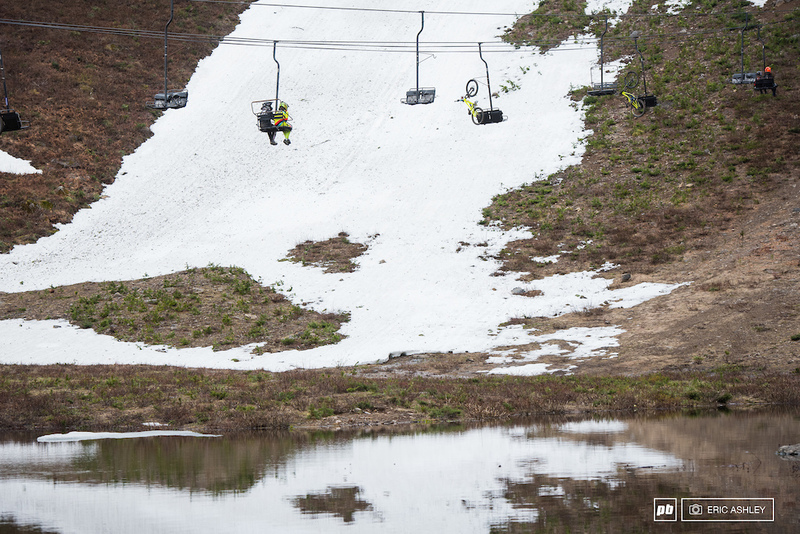 Chris Waller rides along a steep bank of melting snow on the bottom of Cannonball (Cat 2 Men 30–39). Steady gusts of winds only added to the cold conditions for racers. 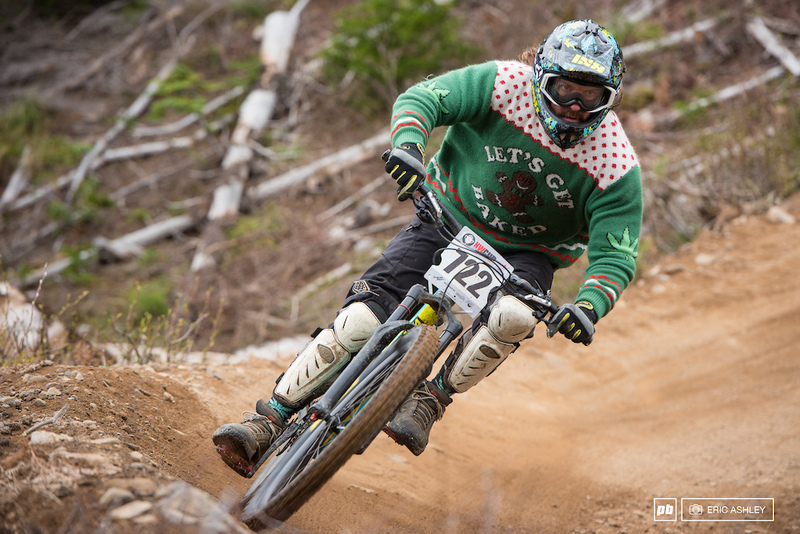 Ryan Green was keeping the "ugly sweater" party going and took fourth while doing it (Cat 1 Men 30–39). Ryan Richards puts the pedals down for a fast practice run on Sunday (Cat 2 Men 15–18 ). 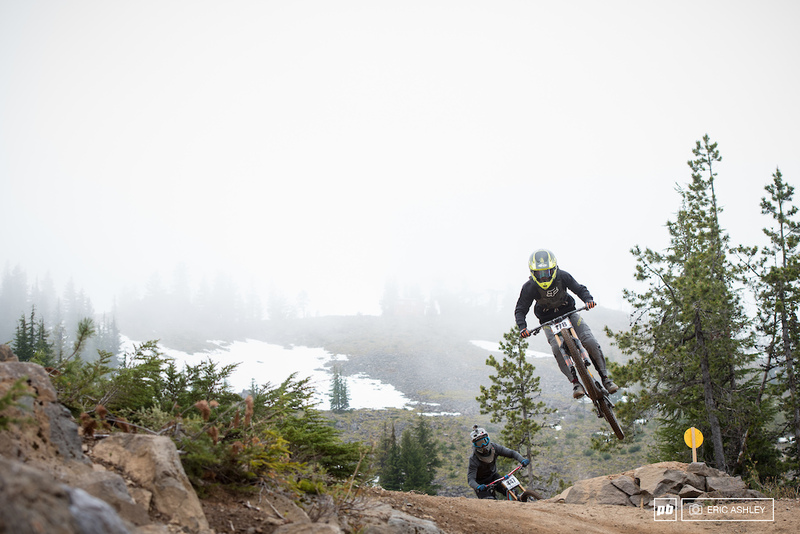 Riley Plummer gets a last little bit of air on Cannonball (Cat 2 Men 0–14). Declan Ervin takes flight against a foggy background during practice (Cat 1 Men 0–18 ). 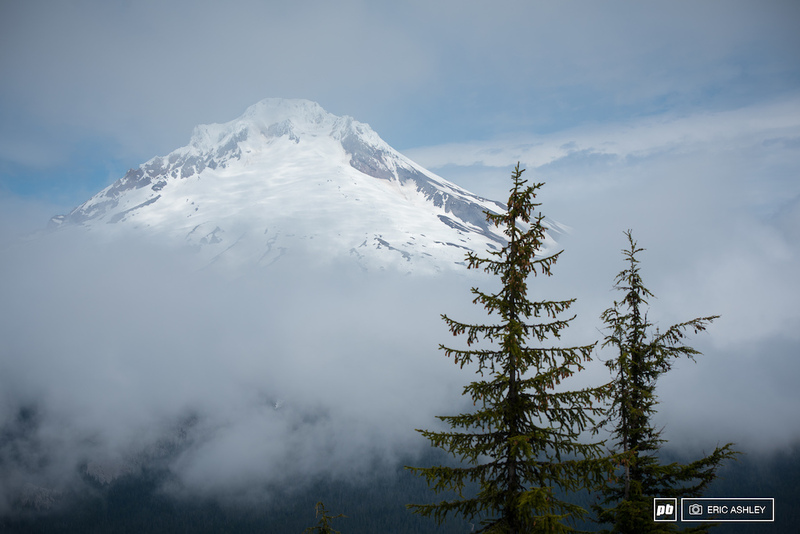 The day's cold clouds kept Mt. Hood obscured until the afternoon. Bryce Kans had a good start to the day by seeding third. He lost a little ground in the afternoon but managed to hang on to a step of the podium (Cat 1 Men 0-18 ). 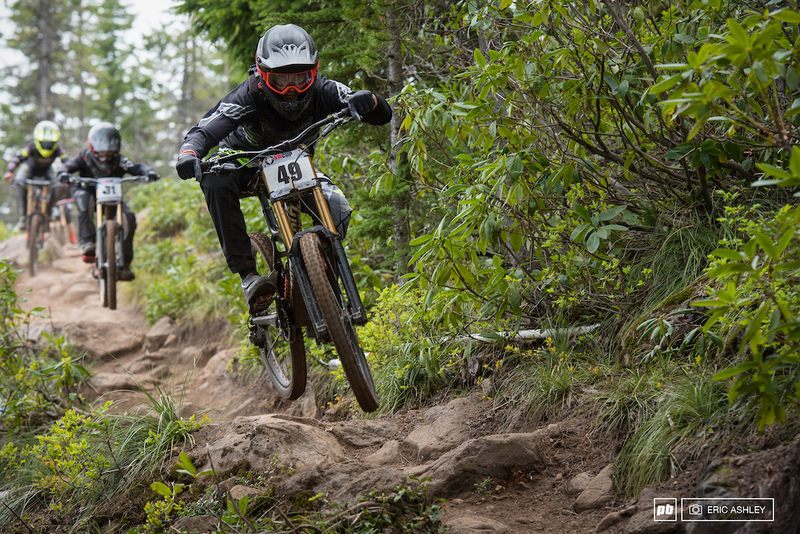 Andrew Gore sporting a characteristic grin as he launches into his seeding run (Cat 1 Men 0–18 ). 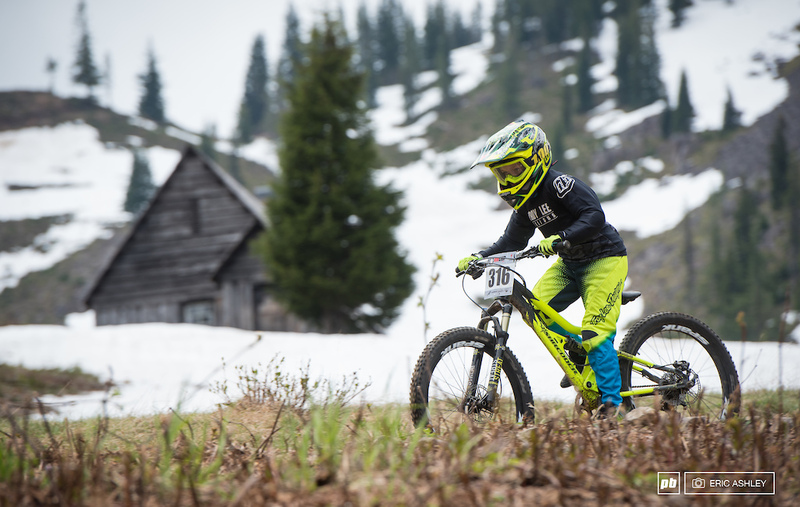 Declan Ervin has been pushing hard this year. 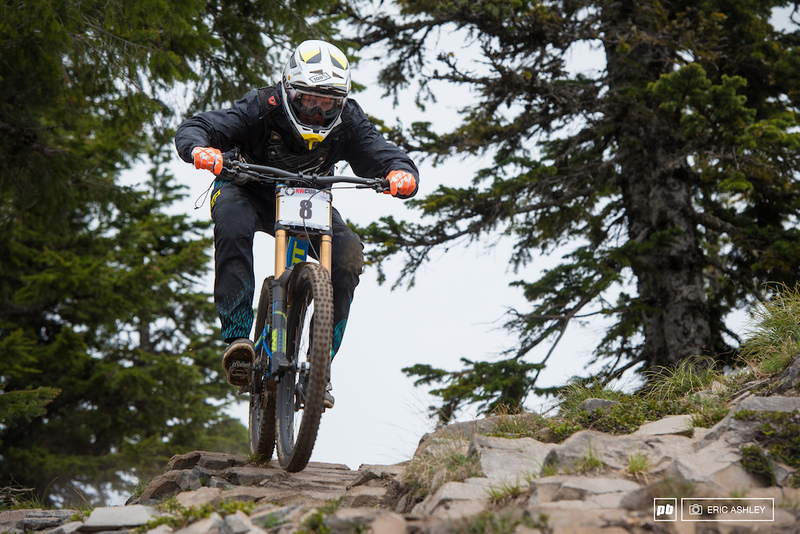 Skibowl netted him the fourth spot in seeding time and third step on the podium at the end of the day (Cat 1 Men 0–18 ). 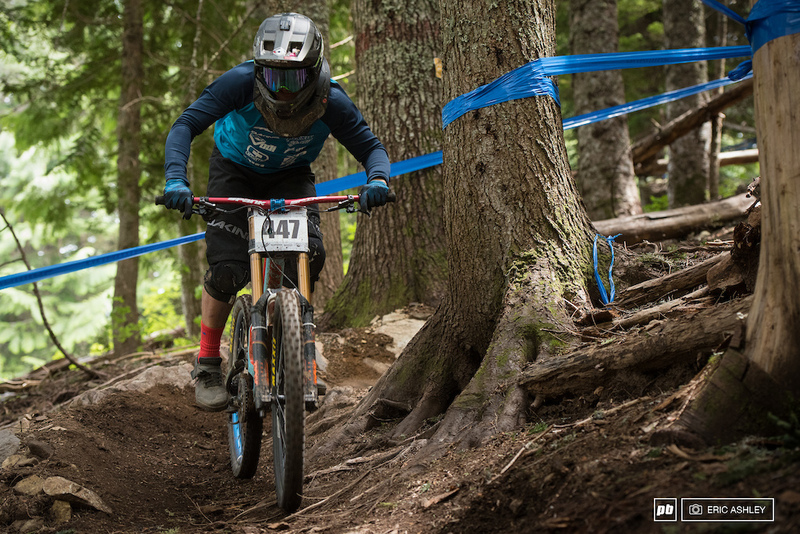 Portland rider Kerstin Holster led the charge to take the top seeding spot for Pro Women. 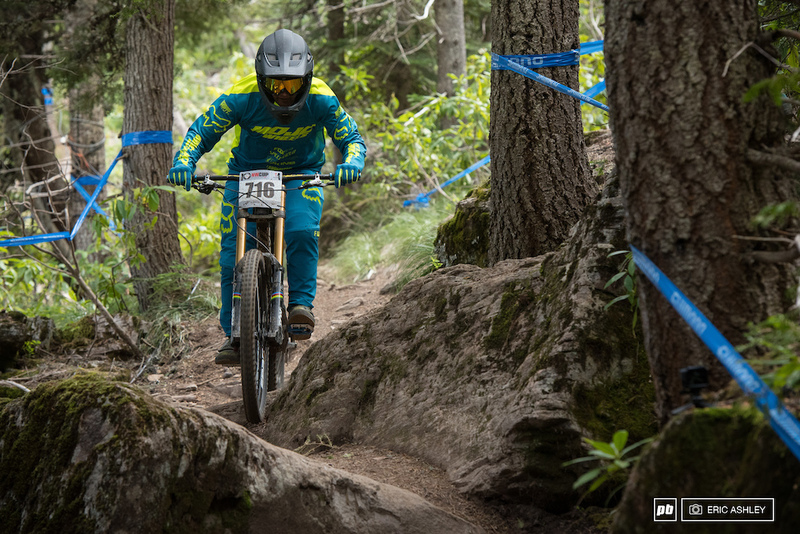 Lauren Heitzman-Patterson made her first appearance for the season and held down spot number three for seeding (Pro Women). 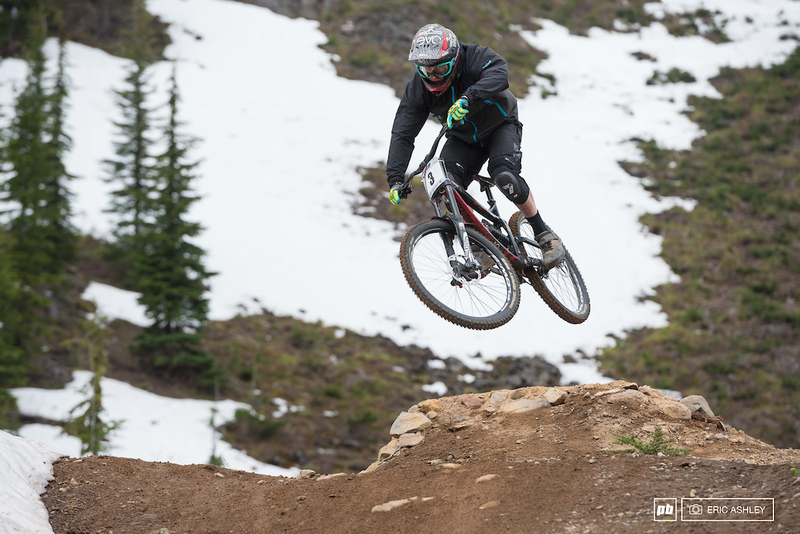 Better known as the "owner of the white bulldog from the podium," Trevor Lewis also is doing really well during his first year racing Pro Men. Lewis seeded fifth. 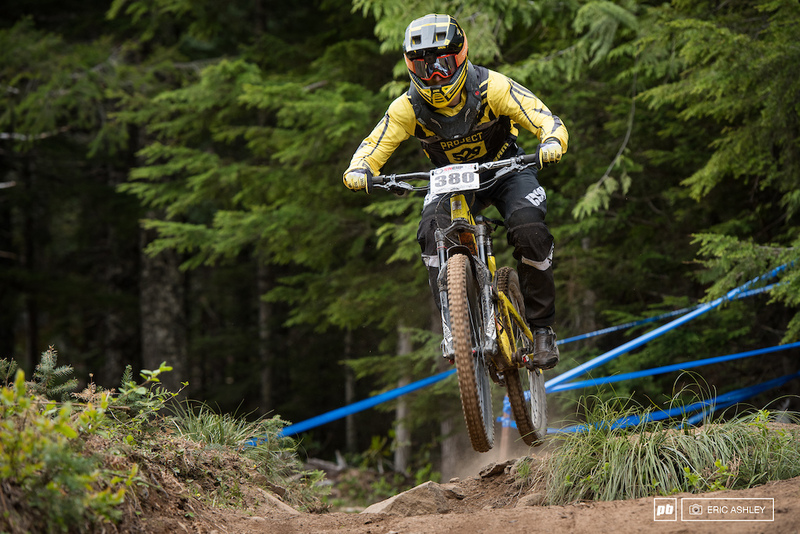 Evan Geankoplis last raced at Skibowl in 2014. 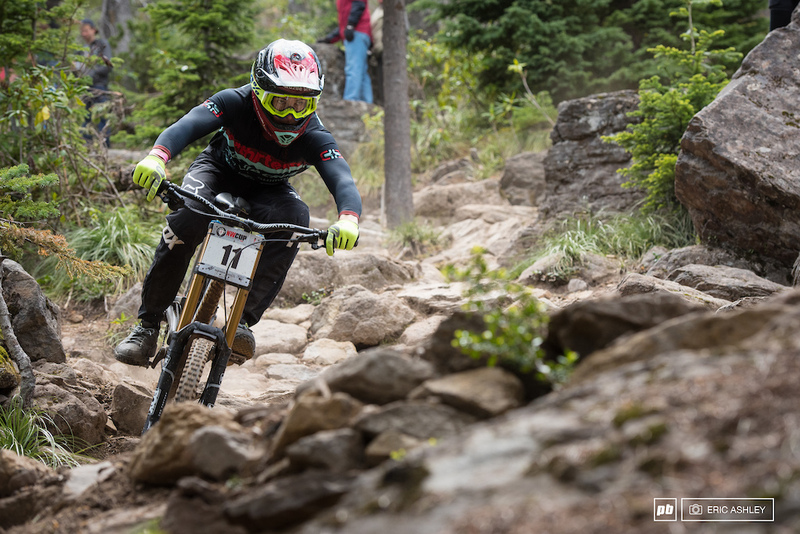 For 2017 he re-familiarized himself with the course by landing spot number three during seeding (Pro Men). 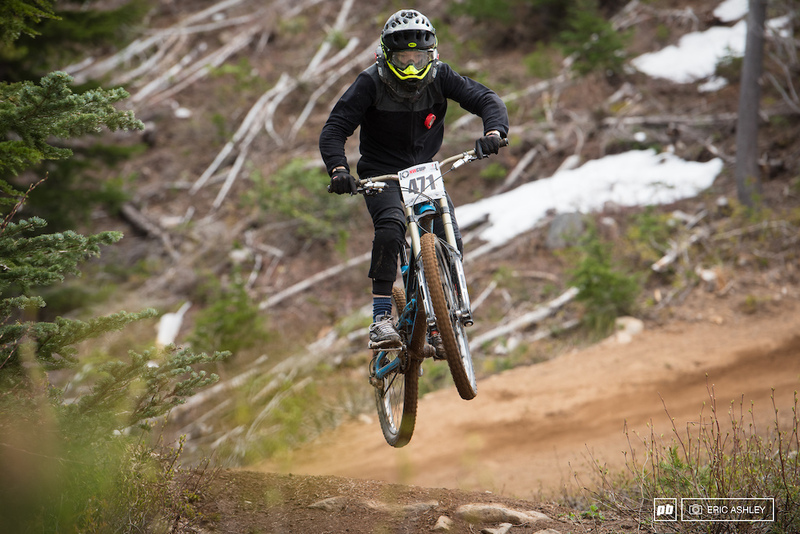 After figuring out the limit of Skibowl's turns on Saturday, Nikolas Clarke was putting in solid runs on Sunday. Clarke seeded 13th (Pro Men). 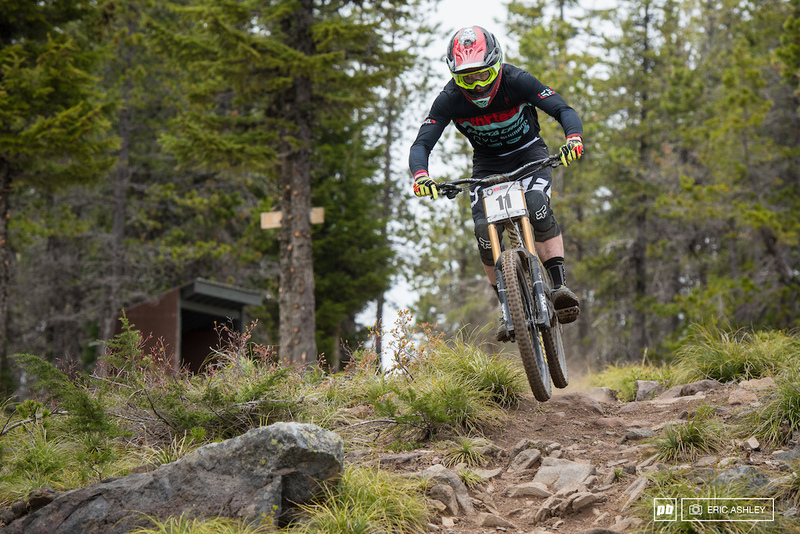 Jake Grob launches over the basalt at the top of the Ridge Trail to seed seventh (Pro Men). 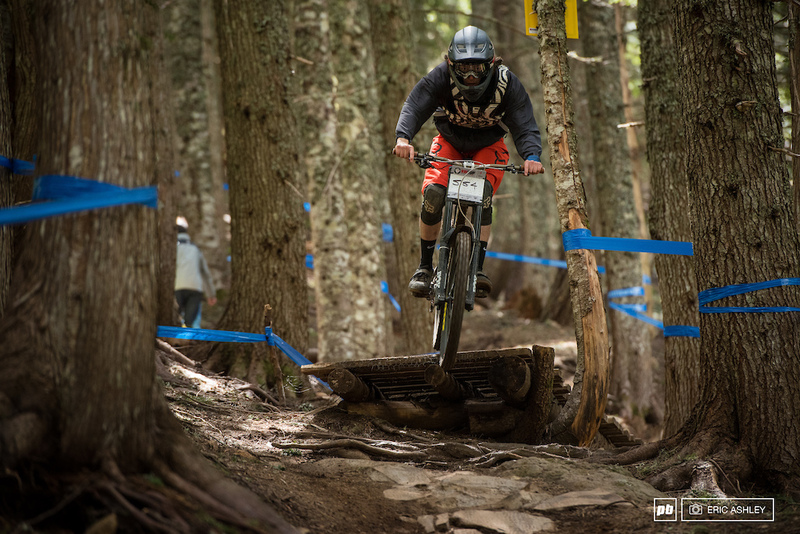 Matt Orlando's bid for the top spot looked promising after he landed second in seeding (Pro Men). 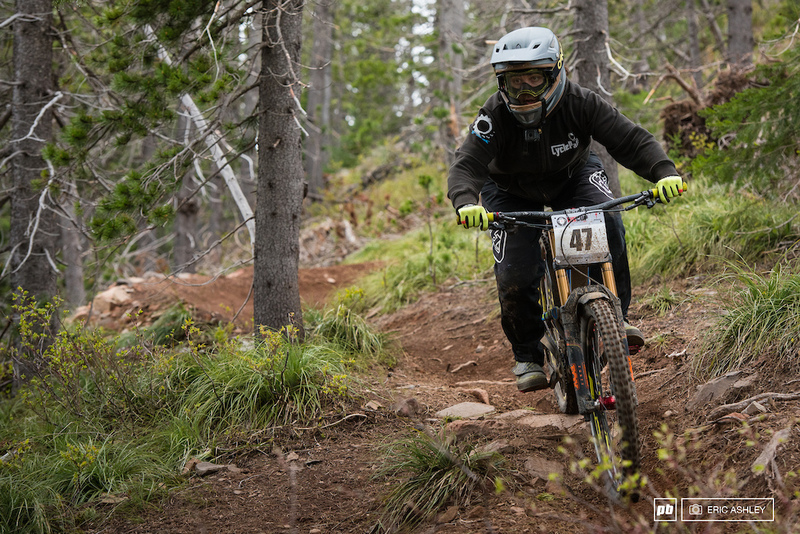 Nate Furbee led the pack and took spot number one for the morning (Pro Men). 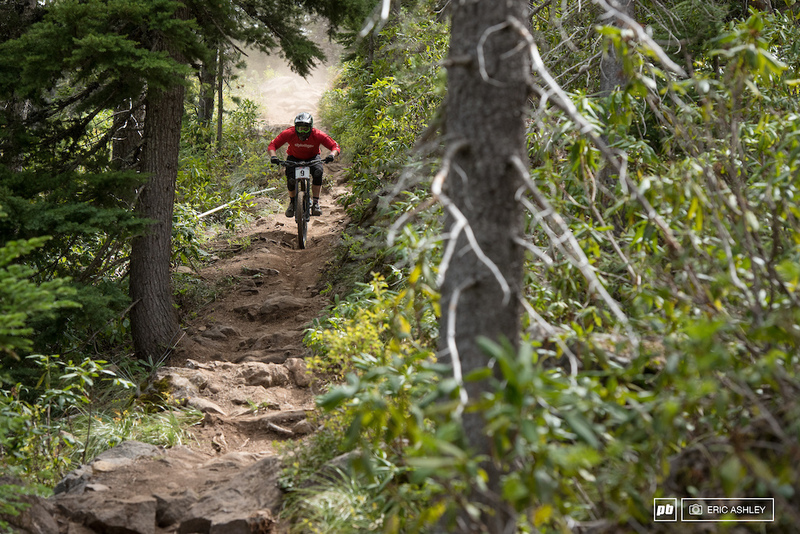 The down-lift seems a lot steeper, but you meet some nice riders on the way down. 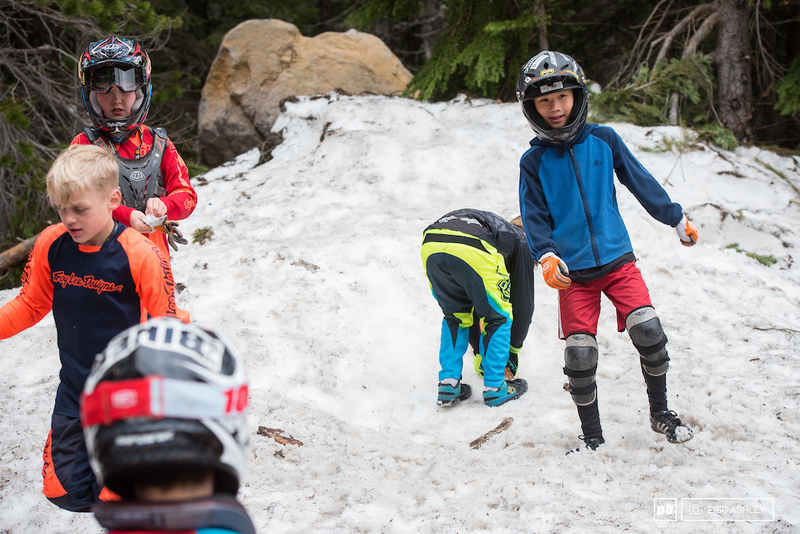 The Cat 3 groms didn't let perfectly good snow go to waste while they waited for the start gate to be relocated. Wyatt Mckenzie was riding all in and nabbed third for his best finish so far this season (Cat 3 Men 0–10). 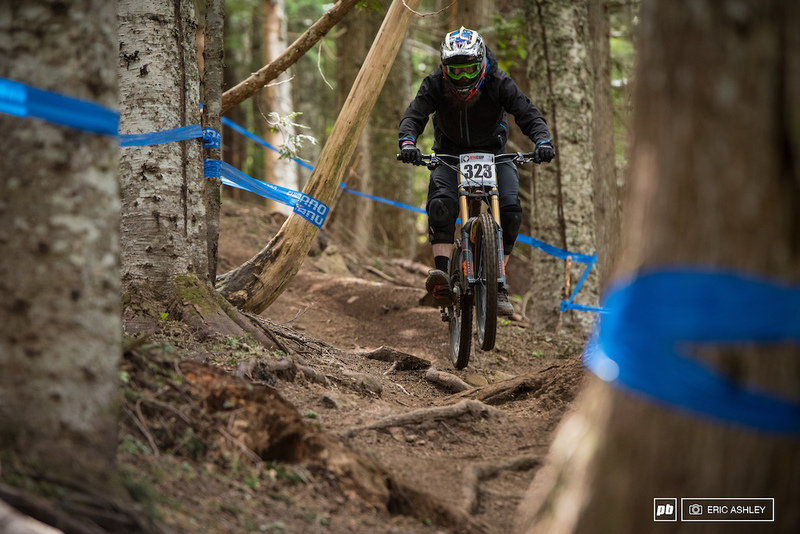 Mica Erickson spots her turn on Gnar-Gnar on the way to clinching her first NW Cup win (Cat 3 Women 0-10). Camron Ratkoviak was all smiles on the way down with coach right behind (Cat 3 Men 0–10). 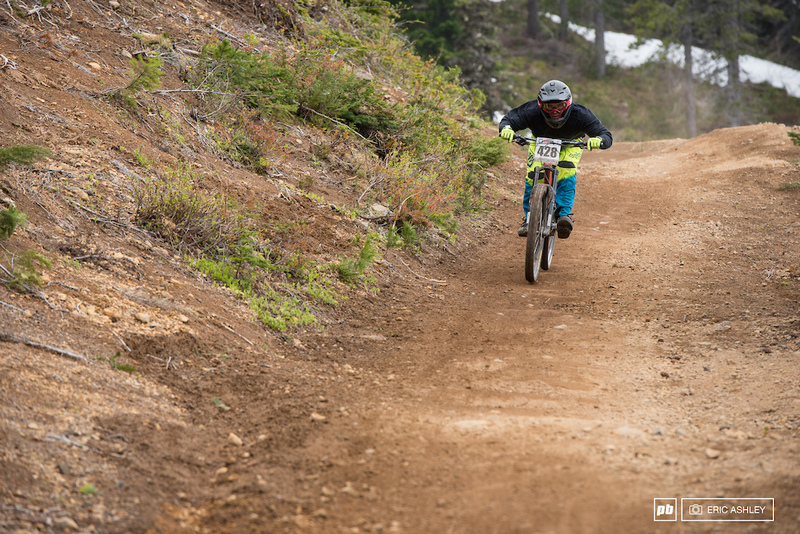 Aletha Ostgaard made good time down Gnar-Gnar landing her in second (Cat 3 Women 0–10). 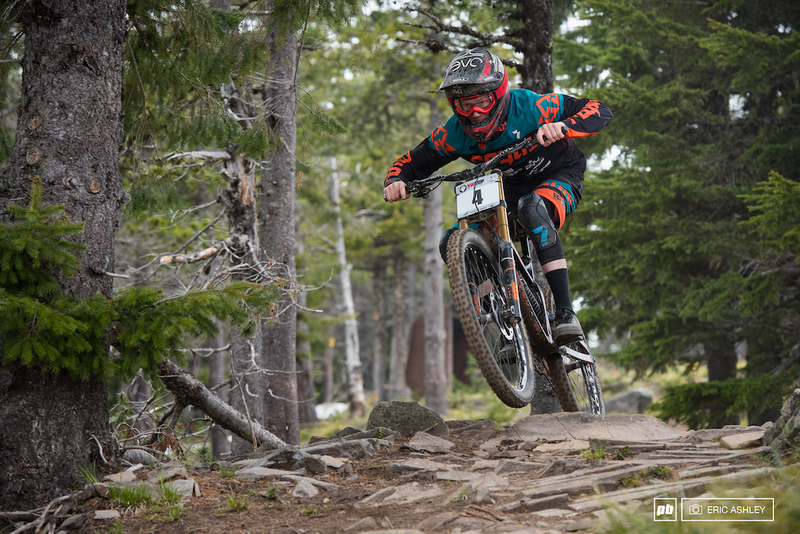 Trish Connolly catches some air on lower Fire Hydrant trail on her way to third (Cat 3 Women 40+). Most of the quick lines through the Fire Hydrant rock garden involved a series of small rocky doubles at the exit. Lorant Domokos (Cat 3 Men 19–39) took his third fourth-place finish of the season with a time just 0.024 back. 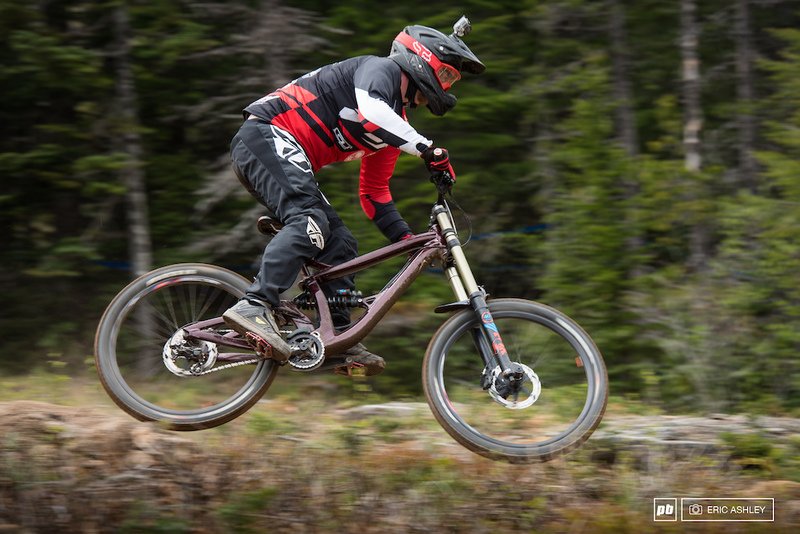 Jason Gibb jumped back in after over a year hiatus from racing. Things must have felt just at home because he took third (Cat 2 Men 50+). 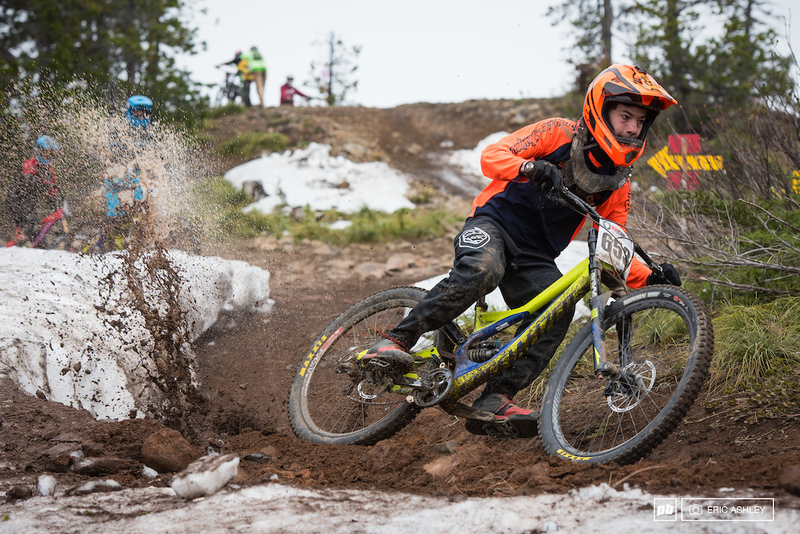 Colin Drake's inside-to-outside-to-huck was the course's most creative line of the day and likely helped put him at the top of the podium (Cat 2 Men 30–39). 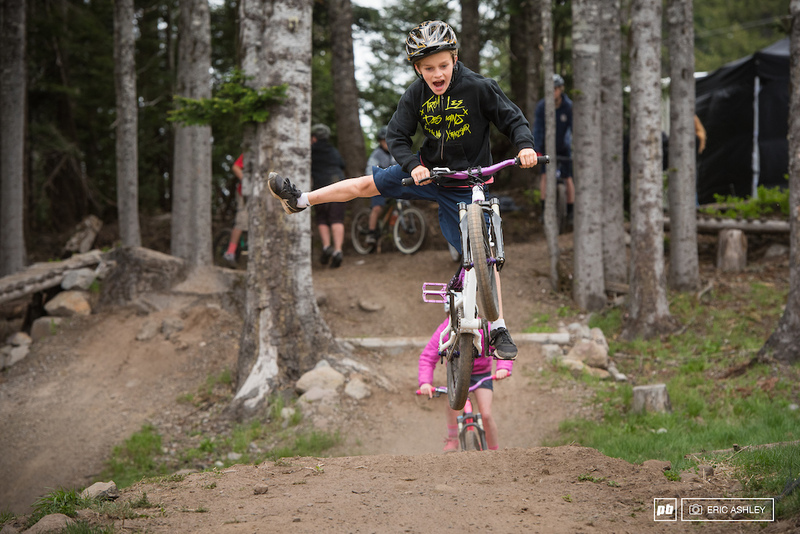 Jack Frischkorn was clearly fastest in his class through the rock garden. He finished nearly 14 seconds up (Cat 2 Men 15–18 ). Mason Good digs deep to boost through the rocks (Cat 2 Men 15–18 ). 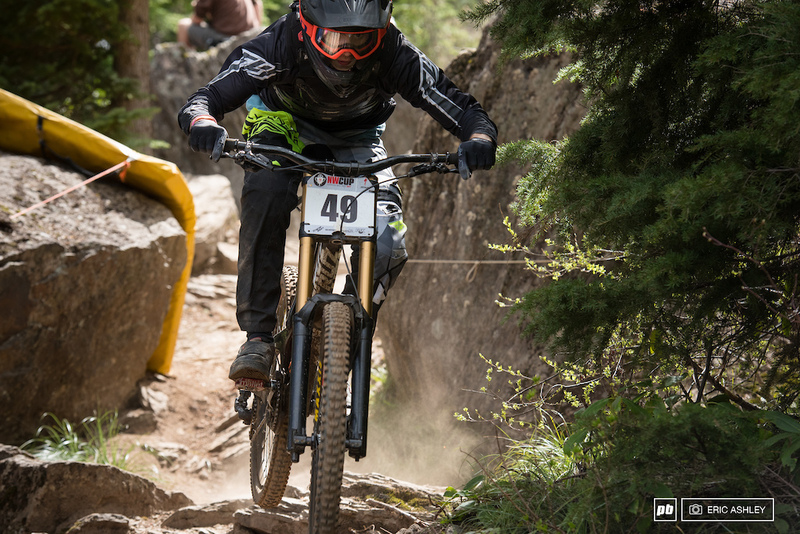 Local rider Jacob Smith took second behind Jackson Goldstone (Cat 2 Men 0–14). 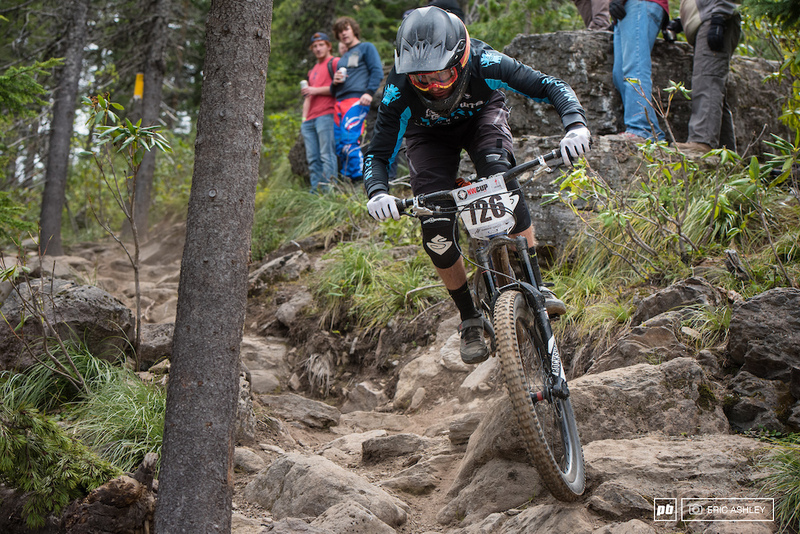 Talon Northern cranks through en route to the rock garden (Cat 2 Men 0–14). 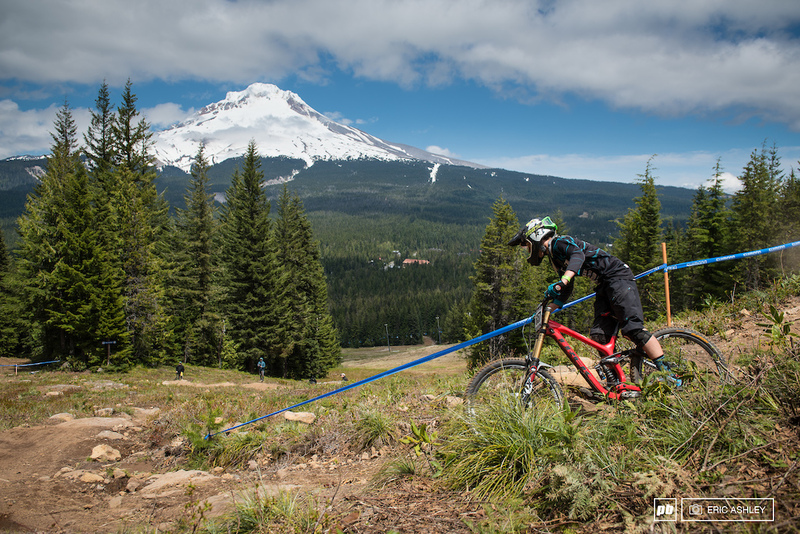 The top of the Fire Hydrant Trail has one of the best on-course views of Hood. Too bad it's also a brutish pedal. Brielle Stern (Cat 2 Women 0–18 ). Cole Townsend laid down a quick lap that put him nearly seven seconds up (Cat 1 Men 19–29). 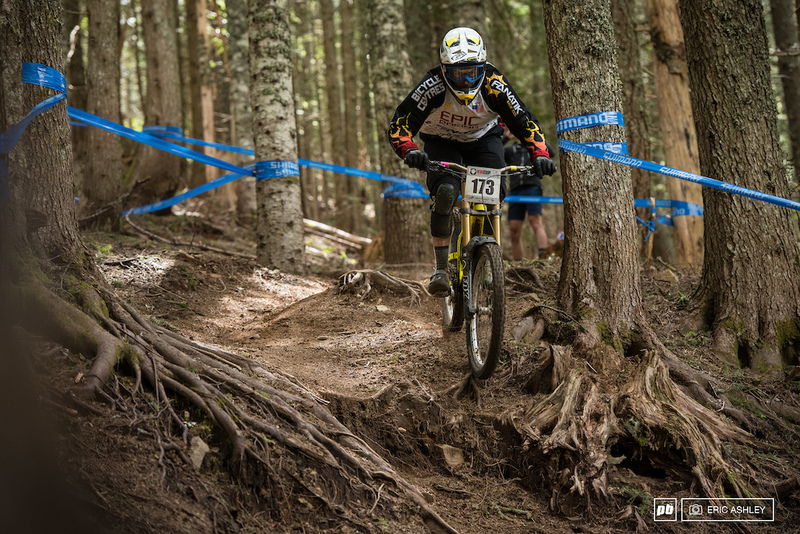 Nik Dommen rides fast through the trees on his way to the bottom of the course and a fourth place finish (Cat 1 Men 19–29). William Floyd airs out of a g-out near the bottom of the course (Cat 1 Men 19–29). 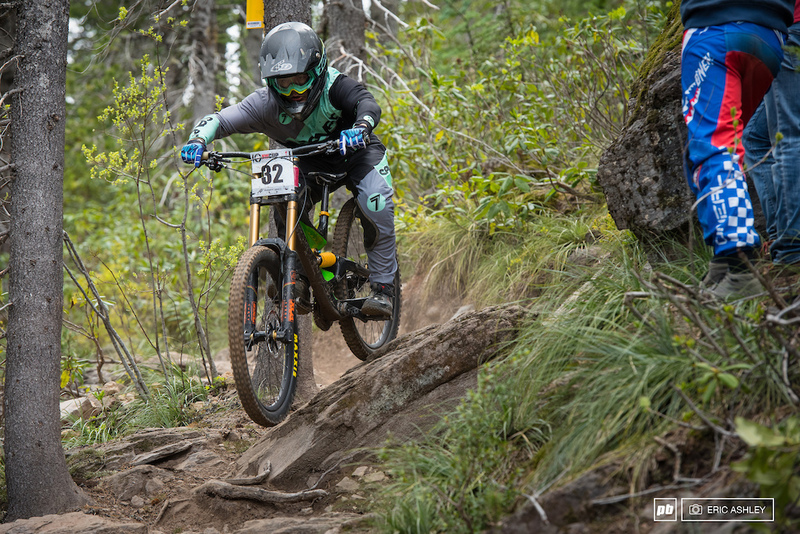 Alli Gaertner followed up her second place finish at Port Angles by taking the top of the podium on Sunday (Cat 1 Women Open). 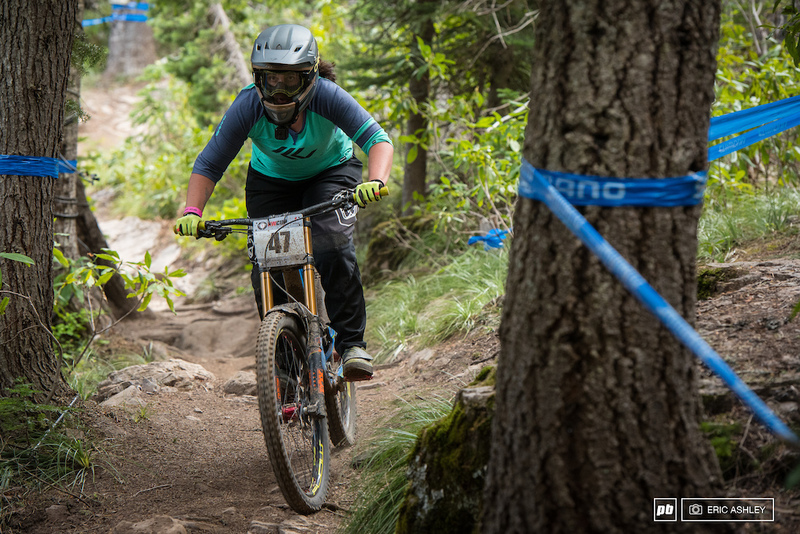 Brycelynn Bassett held her own to take third (Cat 1 Women Open). Matt Macartney edged out Rich Denz to take third (Cat 1 Men 40+). 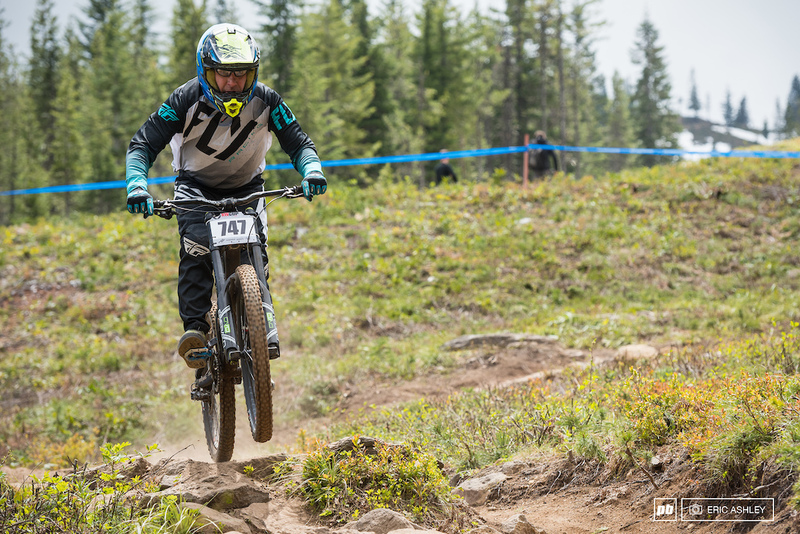 Despite some mechanical setbacks during practice and missing his seeding run, Joshua Fultz-Veihotke brought everything together to take second (Cat 1 Men 0–18 ). Chris Wharton found a little more time and moved up a spot to finish fourth (Cat 1 Men 0–18 ). 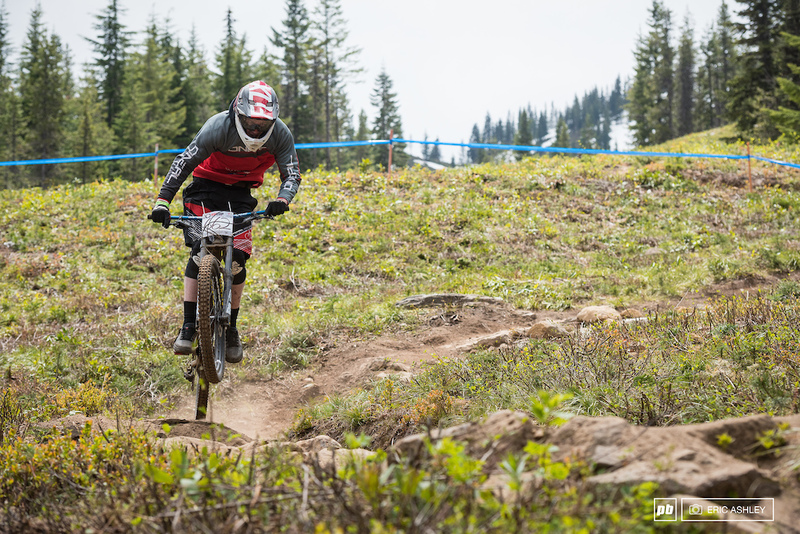 Dylan Brown followed up the number one seeding time with his first Junior's win (Cat 1 Men 0–18 ). 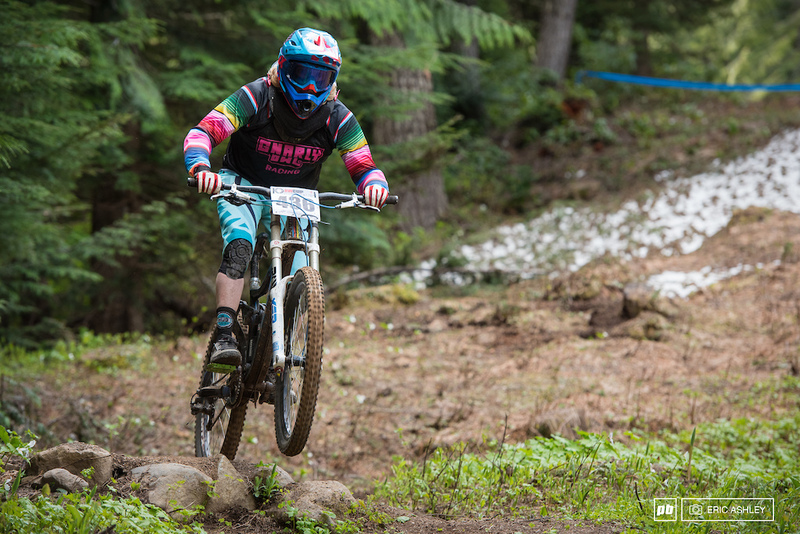 Lauren Heitzman-Patterson maintained her pace and kept her spot in third (Pro Women). 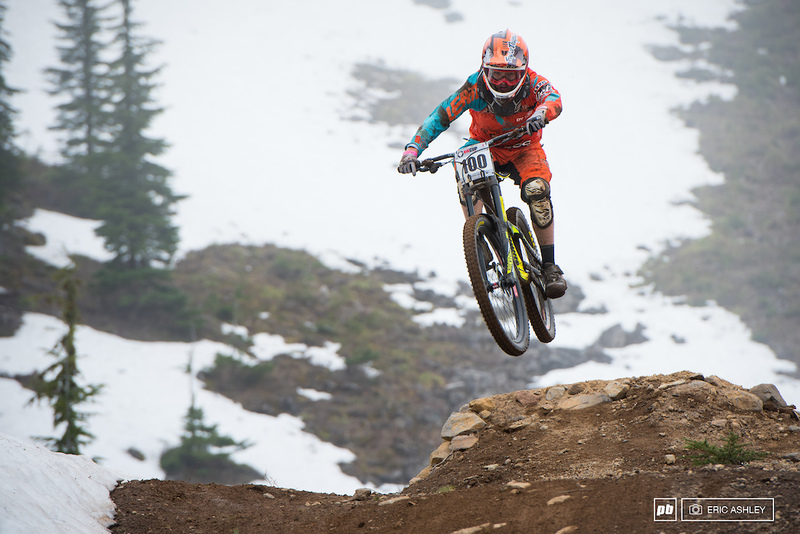 Kerstin Holster lost ground to Kaytlin Melvin and finished the day in second (Pro Women). 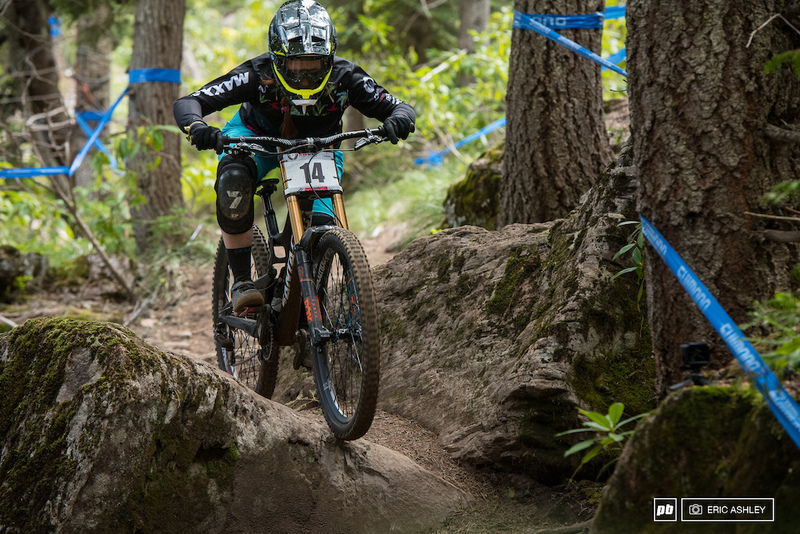 Eye on the prize, Kaytlin Melvin took her first NW Cup Pro Women's win. "The laps were really fun all weekend, I really like Hood so it was great to get back!" 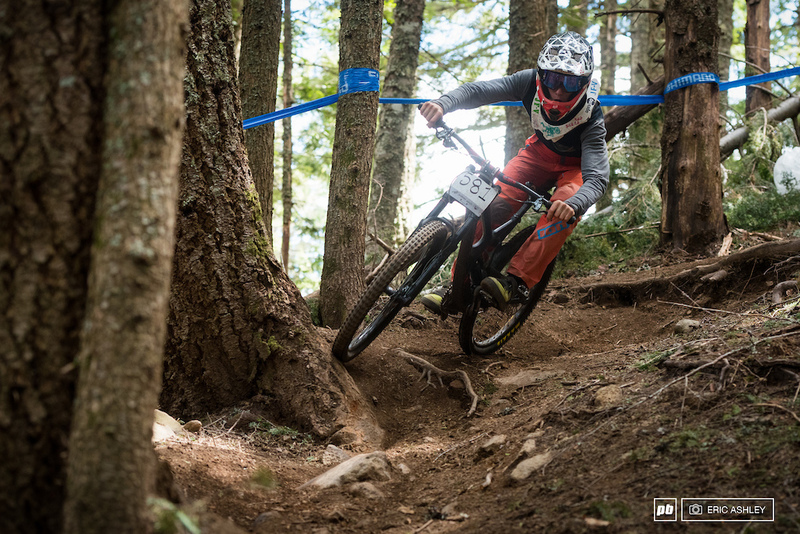 Jesse Ransavage makes his way down the rhododendron tunnel... Which is in no way as leisurely as it sounds (Pro Men). 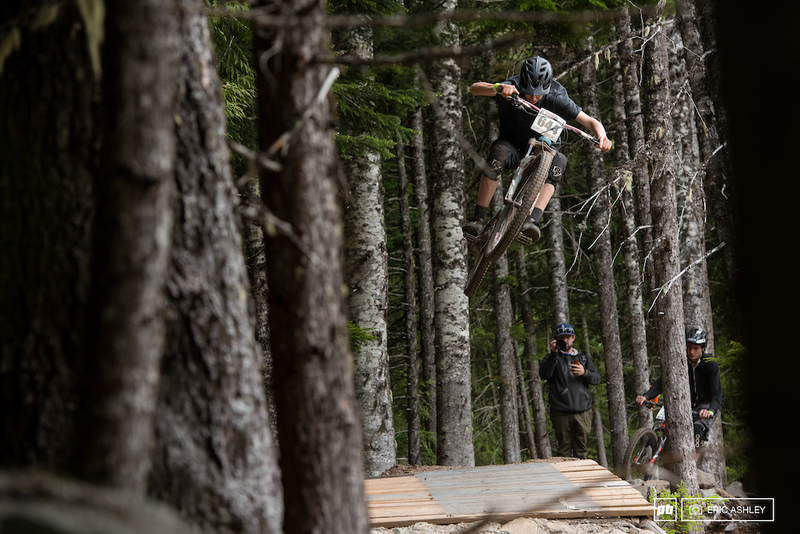 Nikolas Clarke put together a clean run to finish the weekend in fifth (Pro Men). 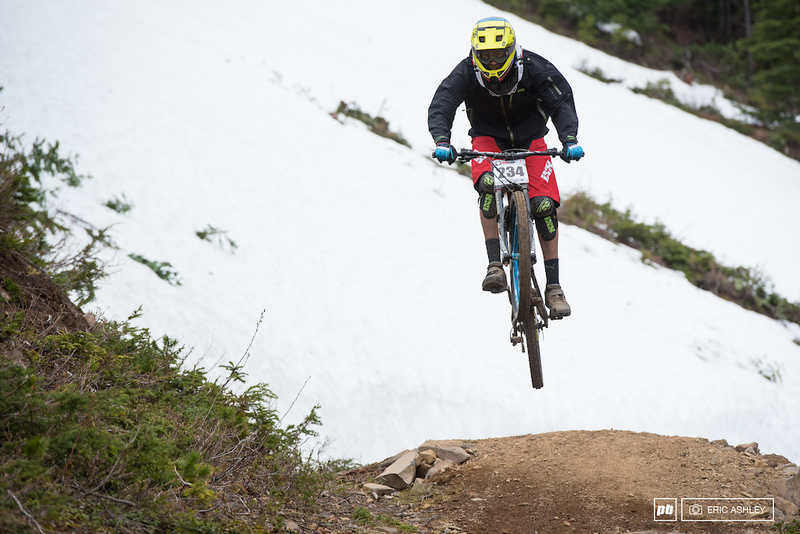 In the last few years, Kasper Dean has seeded well at Skibowl but lost momentum during his race run. He got things turned around on Sunday, starting with spot 16 and turning it into fourth (Pro Men). 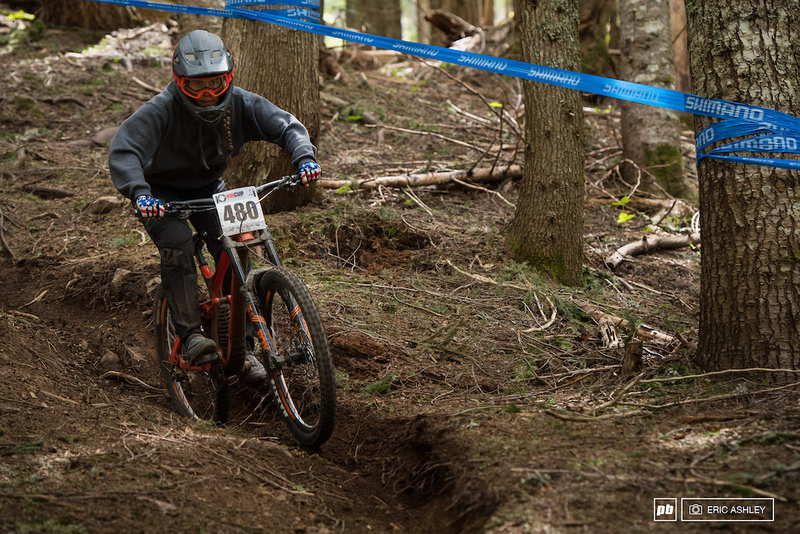 Carson Eiswald struggled throughout the weekend but hammered it all together to take second (Pro Men). 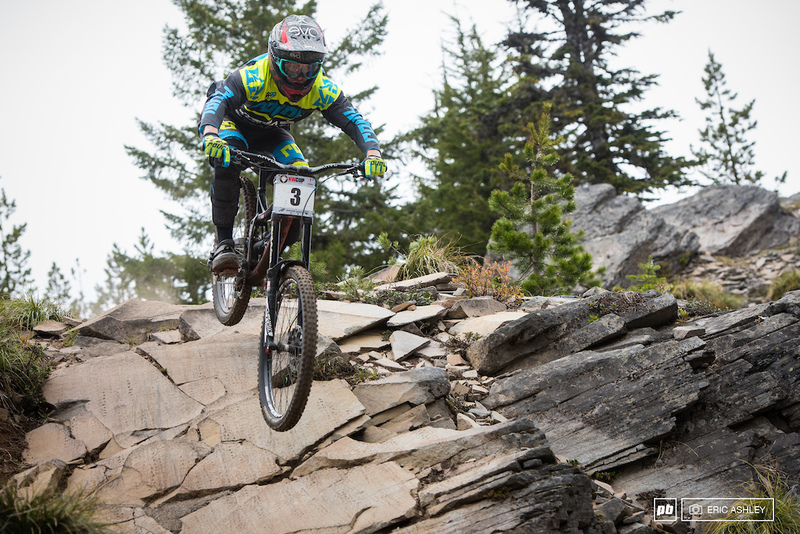 Riley Doyle kept things low and poised through the rocks for a ninth place finish (Pro Men). 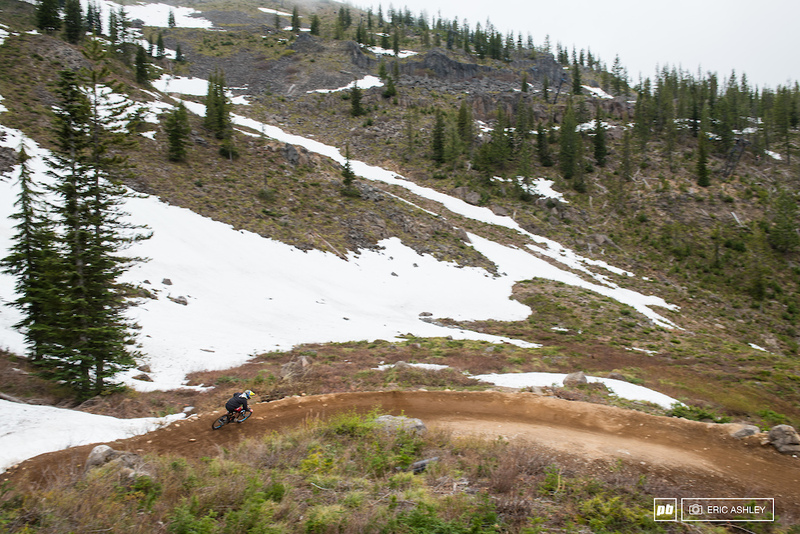 Not very many people raced this course on a single-crown, but Evan Geankopils didn't seem to let it get him down. 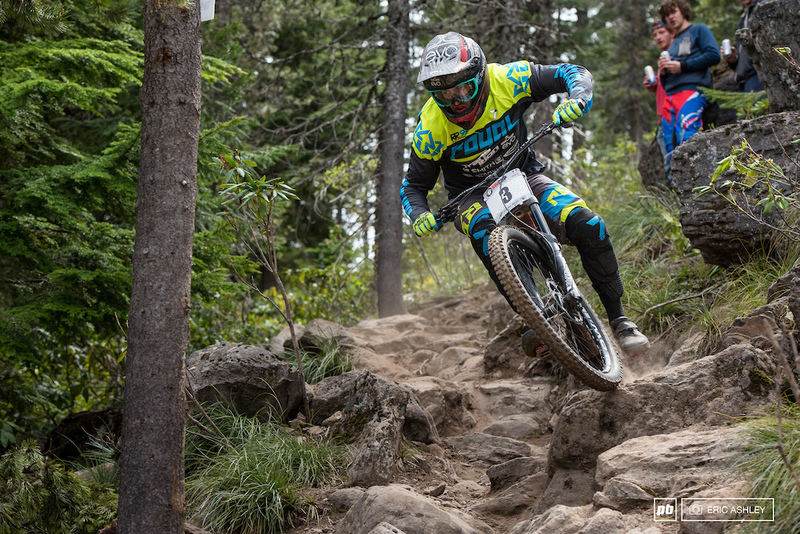 Geankoplis ended less than a second from the podium (Pro Men). 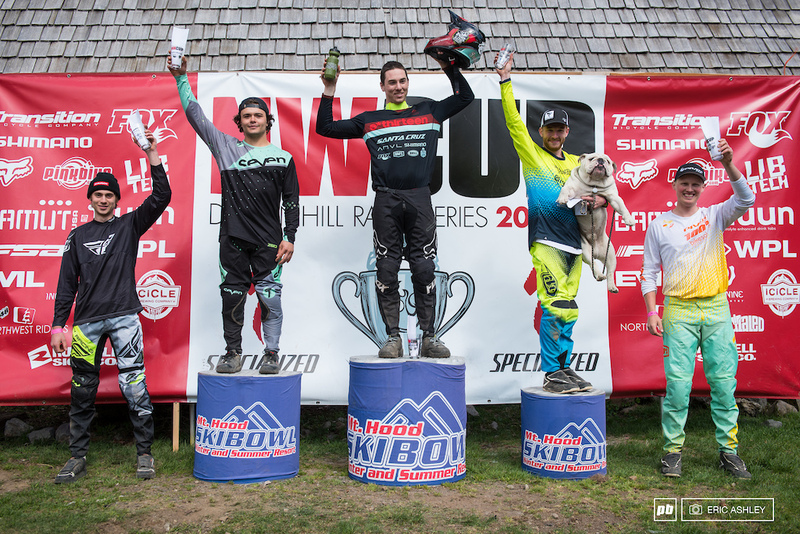 Determined to get Beefy the bulldog on a pro podium, Trevor Lewis put the power down and took third (Pro Men). 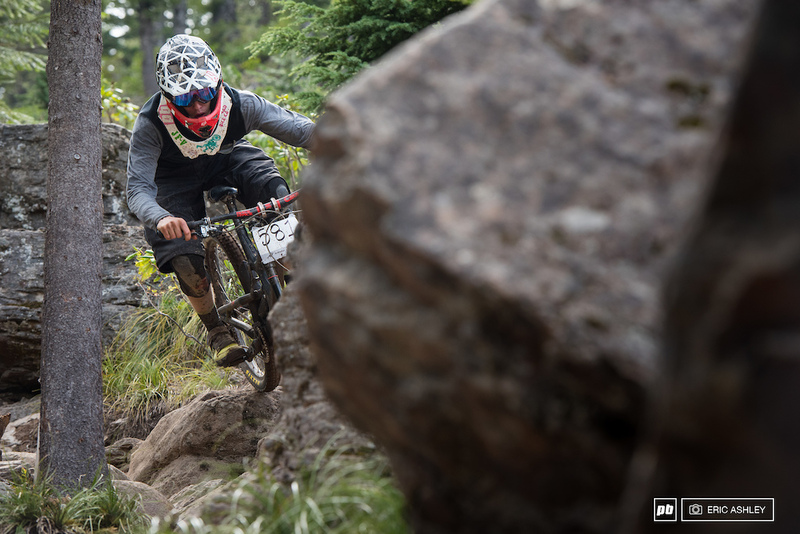 Matt Orlando slammed through the rock garden with an impressive amount of speed, only to have his run fall to pieces with a front flat before the finish line (Pro Men). "It's all about the track. Wide open, really rough, lots of straight lines which suits me." Nate Furbee describing his race run which set a new course record of 3:23.59. 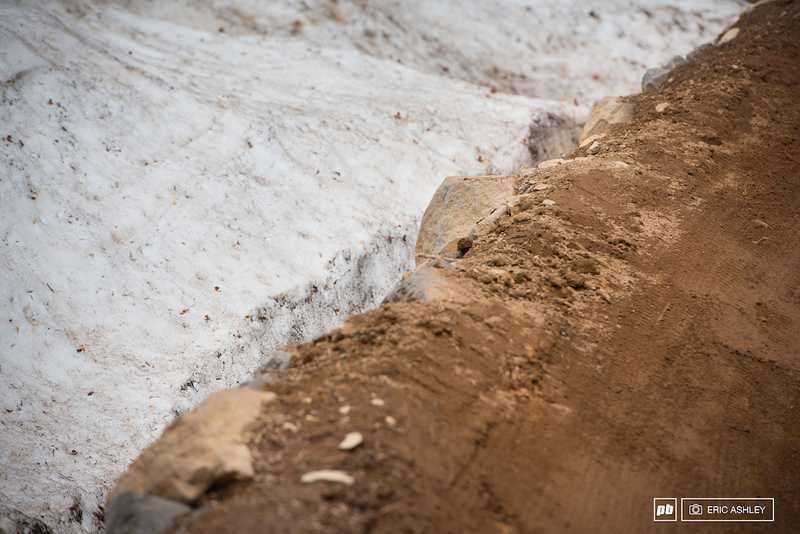 "Every practice run was amazing, the dirt was in great condition after they did so much work up there" (Pro Men). Casey Northern holds up the winning "ugly helmet." 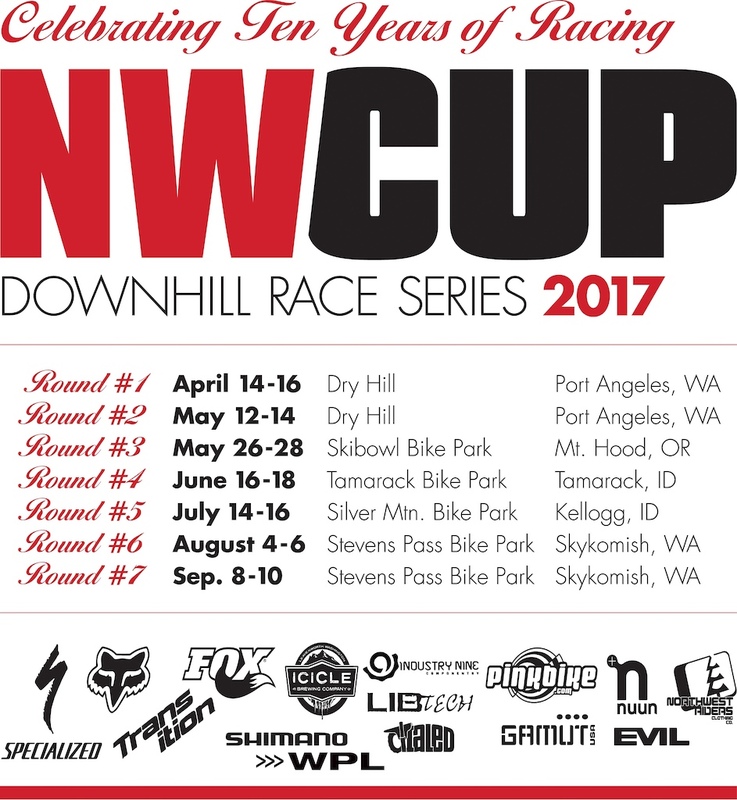 An NW Cup tradition. 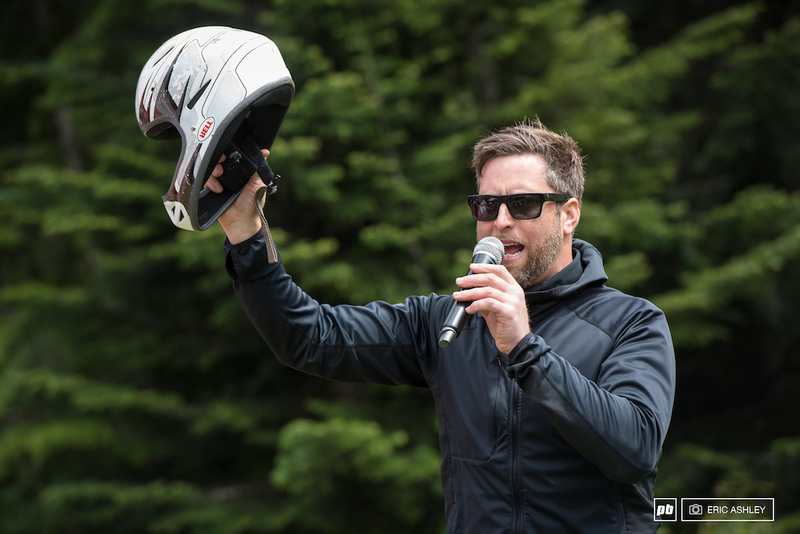 The replacement helmet was provided by Kali Protectives, who was also on site exchanging racers damaged helmets for a free new one. Junior Men Podium: Dylan Brown, Joshua Fultz-Veihotke, Declan Ervin, Chris Whaton, and Bryce Kans. 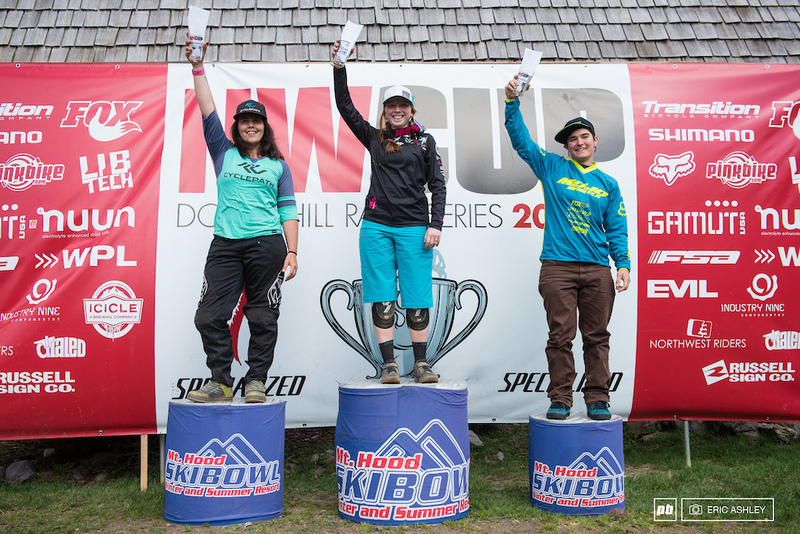 Pro Women Podium: Kaytlin Melvin, Kerstin Holster, and Lauryn Heitzman-Patterson. 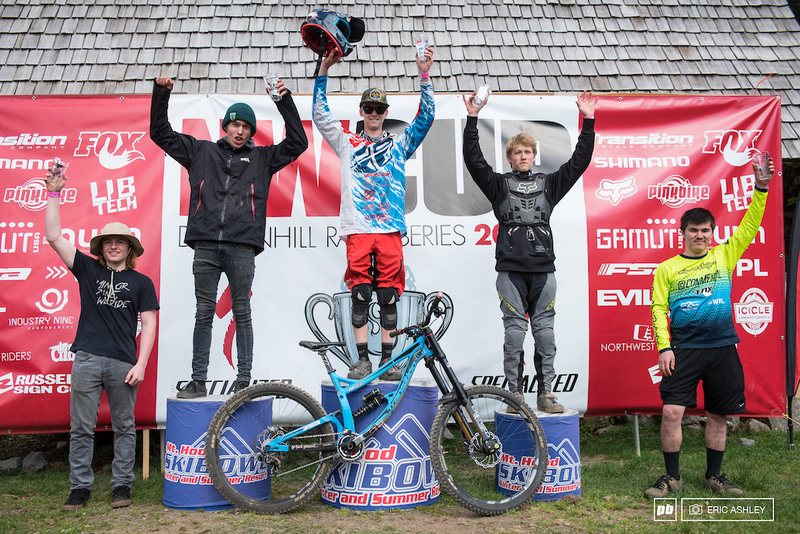 Pro Men Podium: Nate Furbee, Carson Eiswald, Trevor Lewis, Kasper Dean, and Nikolas Clarke. Highlight video by Mt. 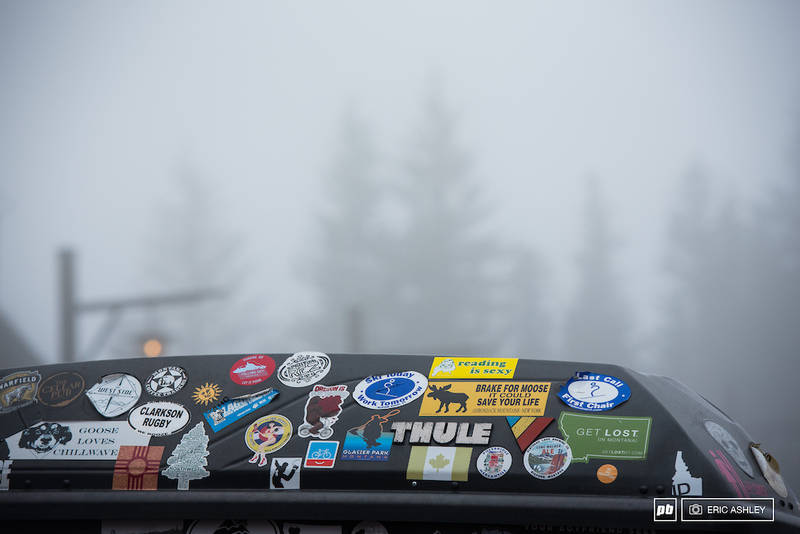 Hood Skibowl. Thank you Eric Ashley for coming to all the rounds and doing these write Ups! We all enjoy them and look forward to them after the weekend. Always the best photo coverage! Good to see you still on the hunt Chris! Canfields still rock, despite the poor photo coverage in this article. Shout out from the Oakland Republic! Camped next to Chris at sea otter last year awesome guy. 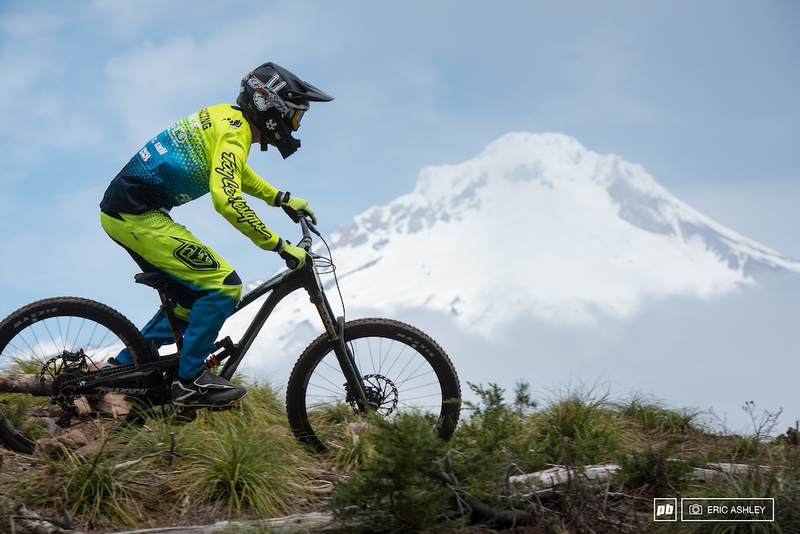 k*** A** oregon mt hood still unplugged & on it!!!! here's to my homeboy Mike H. RIP Pemo RIP Scotty RIP Bob K. RIP. Kimb M. RIP Danny P RIP All legends. All ski bowl! 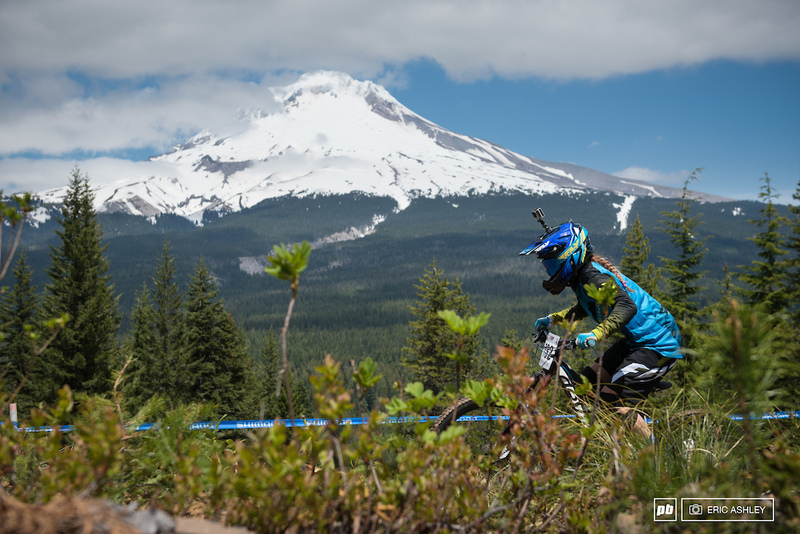 ALL Mt Hood Live Large on the stompin grounds. PEACE! 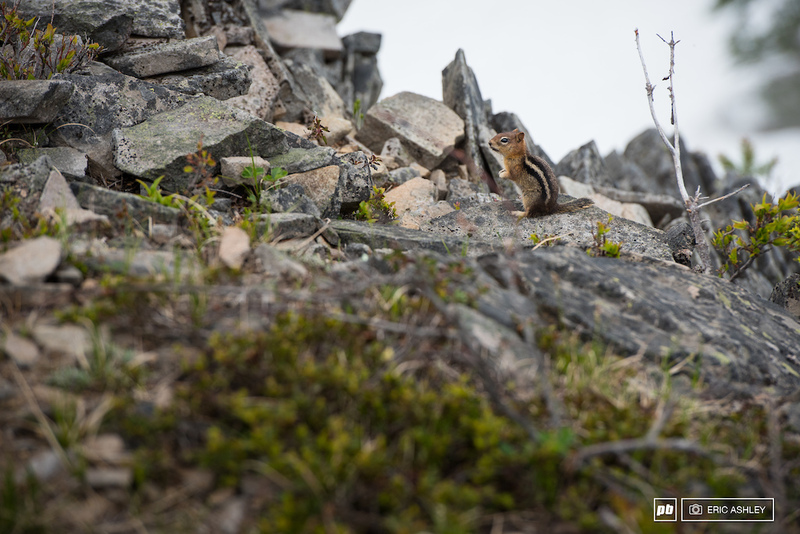 "In a few weekends, this alpine pond will be all gone, replaced by a meadow of grasses and flowers." Then Oregon says "Oh yeah, rain in the forecast". dang it must have been an epic year for snowfall. any idea whose thule box that was?! Great event, thanks everyone at Mt. 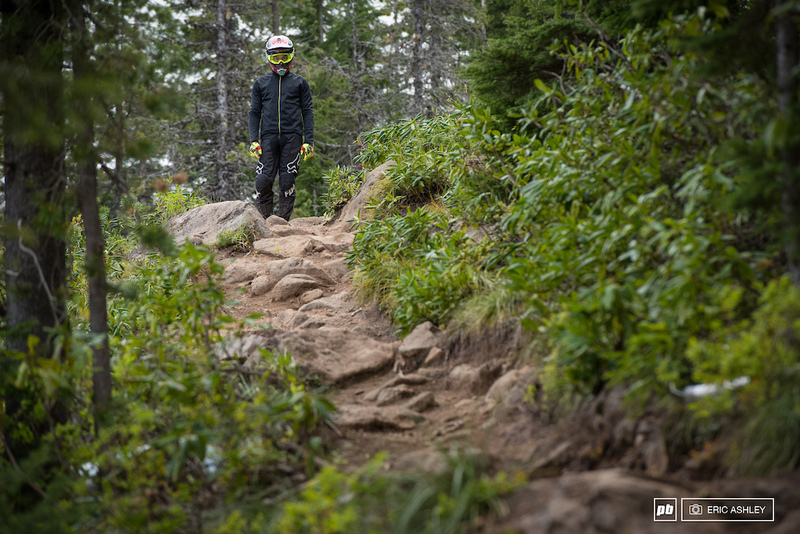 Hood for getting those trails cleared out. Conditions ended up being perfect. Anybody else as bummed as me that the dude in the "lets get baked" Christmas sweater didnt get first on the podium? 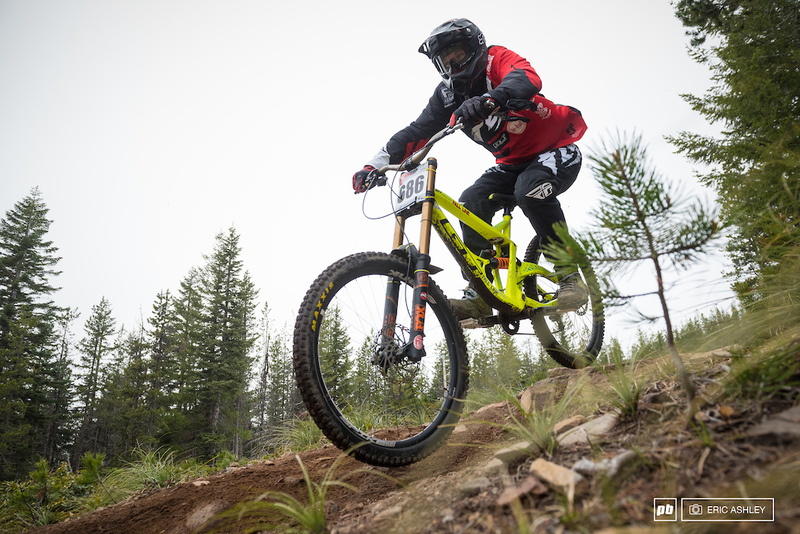 Super fun event, trails were ripping!